How well do you know Badian in the southern part of Cebu? 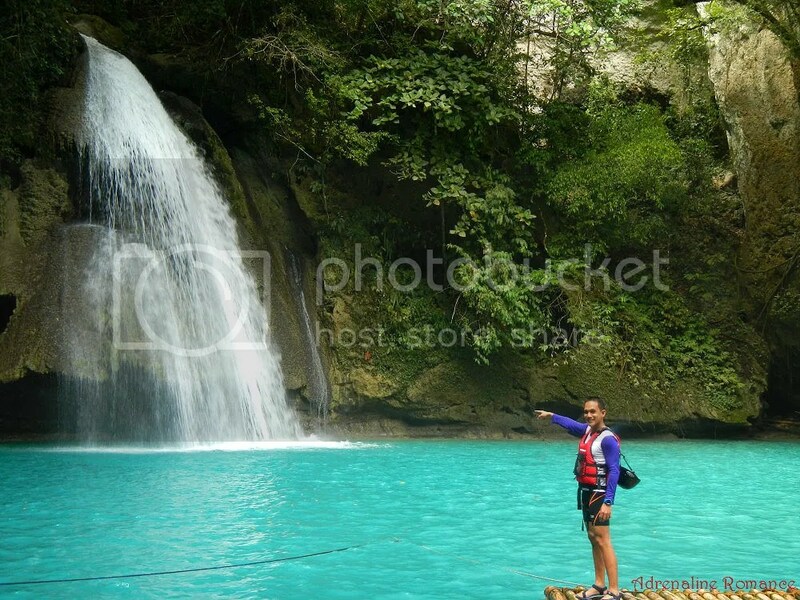 Most of you would associate this third-class municipality of more than 37,000 people with the famous Kawasan Falls. You may associate Badian with Terra Manna, Badian Island, and other amazing white-sand resorts that seemingly beckon you to bask out in the tropical sun or swim out into aquamarine waters. Perhaps Badian is familiar to you due to its lively Banig Festival where expert local craftsmen weave and showcase beautiful native mats. 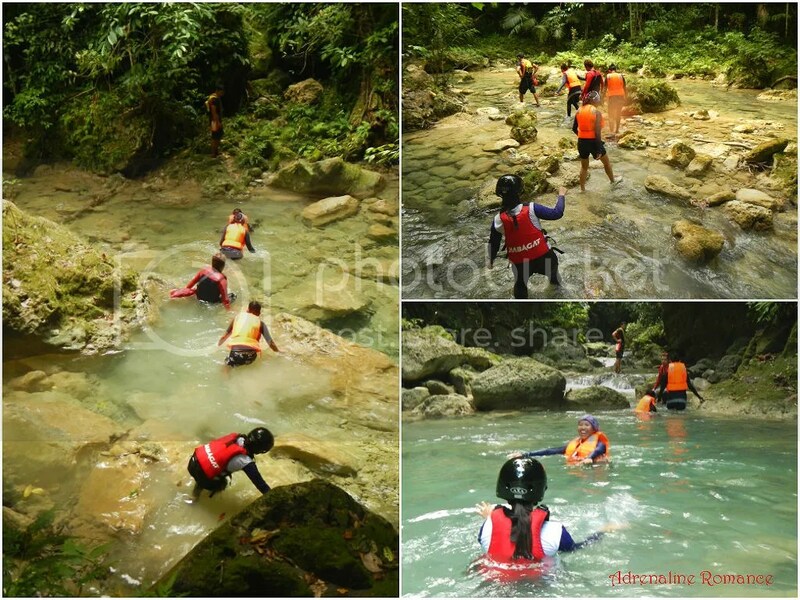 But we bet that only few of you know that the idyllic Badian is an extreme sports enthusiast’s haven. 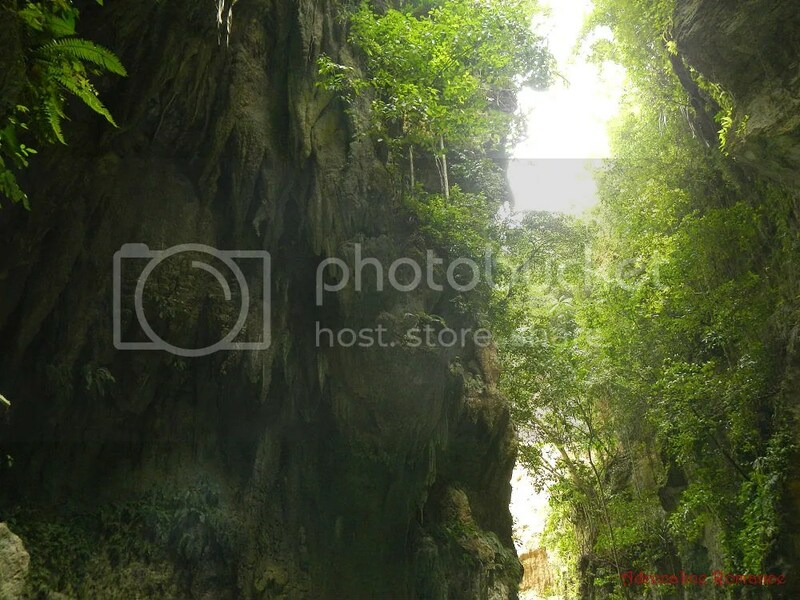 Deep within its lush jungles are deep, wet canyons that were gradually carved by rivers eons ago, canyons that hide dark secrets and wonders. Needless to say, exploring these canyons never fails to tickle the imagination of people who constantly need an adrenaline rush. 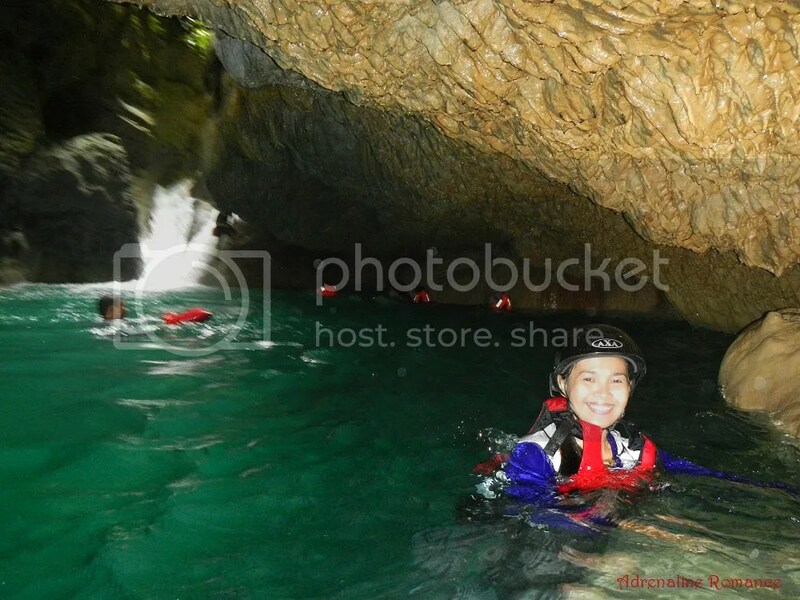 Exploration, traveling, and traversing canyons involve an extreme sport called canyoneering. 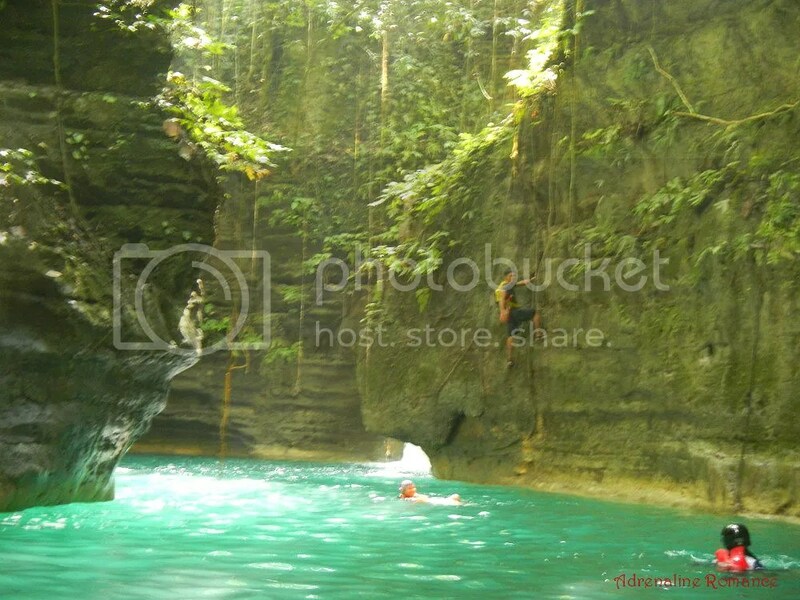 In canyoneering, participants use various techniques that include several other outdoor activities such as hiking, scrambling, swimming, climbing, rapelling, and jumping. In many cases, ropework, technical skills and specialized gears are required to successfully traverse a canyon. 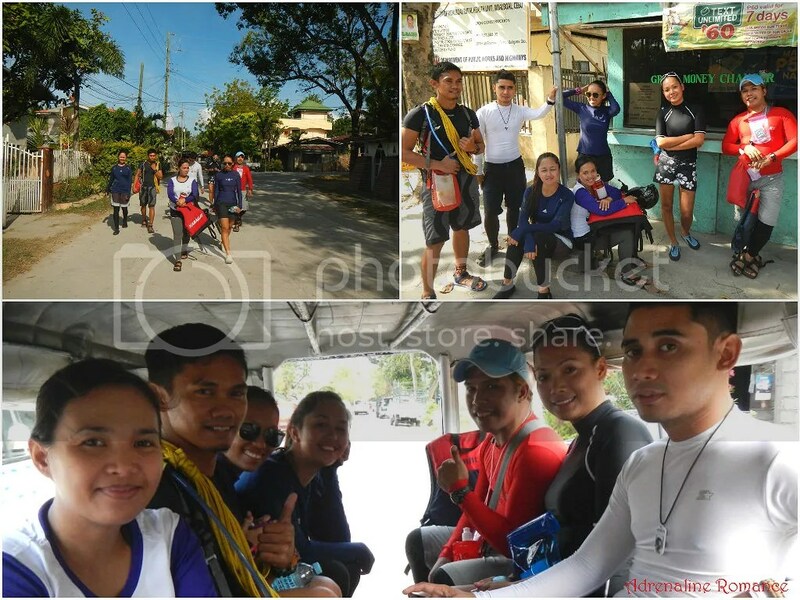 Together with our fellow adventurers, Apol, Mary Jane, Lenny, Choy and Halourd with the guidance of Sir Aldrin “Ya Man,” Sweetie and I had our first taste of canyoneering last March 9, 2014. 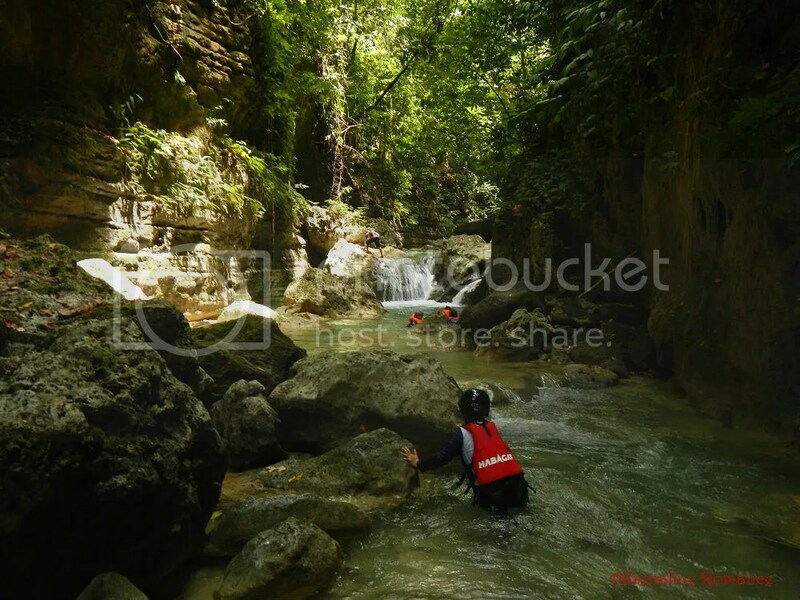 Way before that date, we have unanimously decided to tackle a more challenging Cebu canyoneering activity than usual—going upstream against the river’s current and geological lay of the land. As agreed, we met at the Cebu South Bus Terminal at 4:30 AM. We were able to board an air-conditioned bus bound for Moalboal at 5AM. 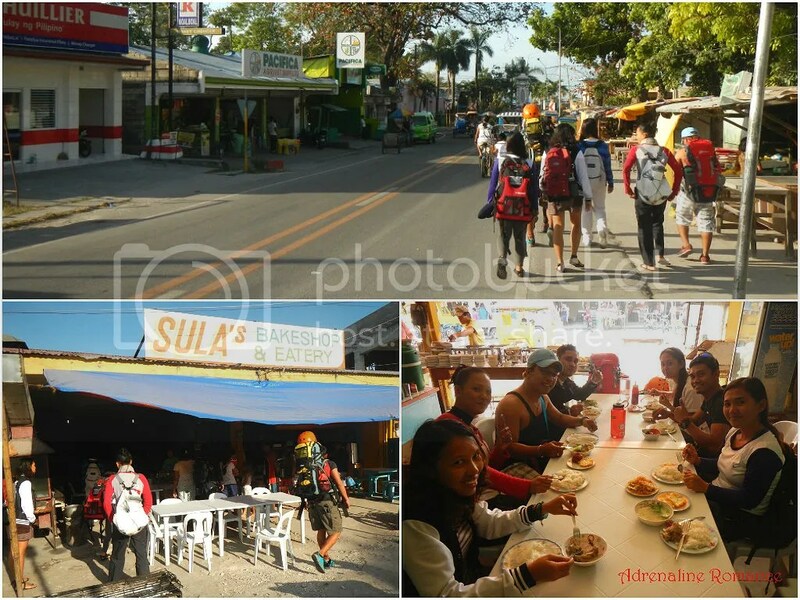 It took us around 2.5 hours to reach the municipality of Moalboal where we took a hot, filling, and full Filipino breakfast; we need the energy for the activities lined up for the day. You might wonder why we had to stop in Moalboal even though the bus we rode actually goes as far as Badian. Well, Sir Ya Man actually lives here, just near the town’s church and plaza. It’s a good thing since we can just leave our stuff and prepare ourselves right in the safety and convenience of his home. Sir Ya Man is the guy in black dry-fit shirt; the lady in yellow is his very accommodating mom. 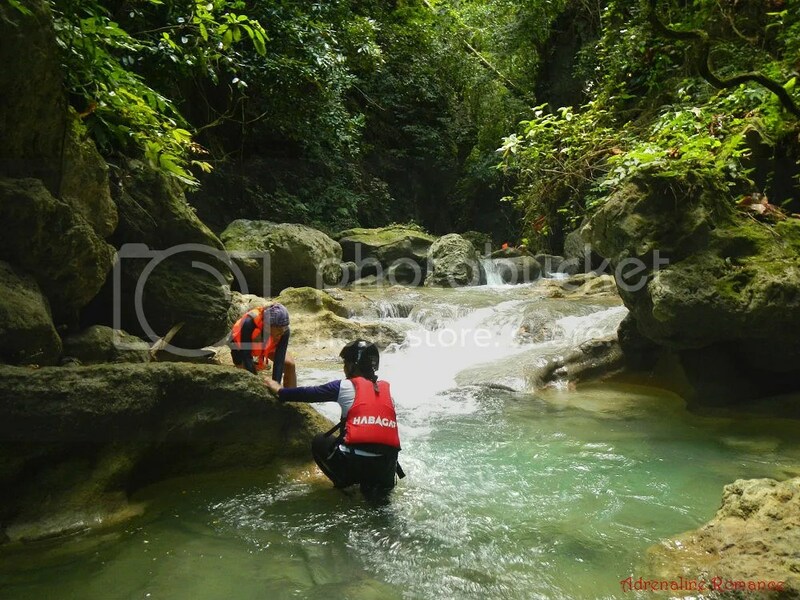 This canyoneering activity also marks the first use of our brand-new personal flotation devices (PFDs) and AXA helmets (we still don’t have money to buy those expensive climbing helmets, so we’ll have to settle on these), which we will also use in our upcoming kayaking activities. Even though I am a strong swimmer (Sweetie can’t swim. Shhhh! ), it is always better to be on the safe side by wearing a PFD. After an hour, we bade goodbye to Sir Ya Man’s mom, walked to the highway, and hailed a jeep that will take us to our entry point in Kawasan Falls in Barangay Matutinao. Oh yes, we had fun talking to an old lady who bombarded us with jokes. Ahhh, the fun of rural life! 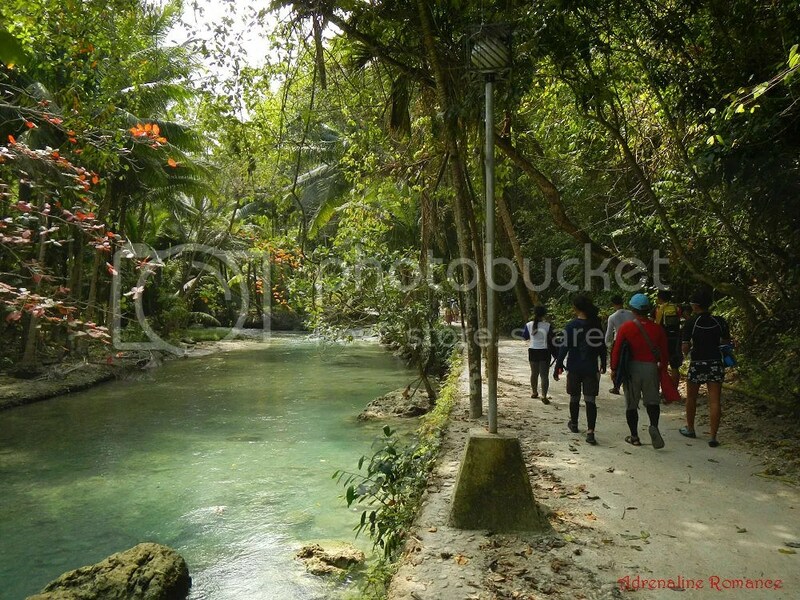 Half an hour later, we arrived at the entrance of Kawasan Falls where we paid P10 for the entrance fee. At this point, Sir Ya Man told us to hasten our pace. Hah! Blame it on the bus; no Badian-bound bus passed our way for 30 minutes. We had to settle on a much slower, smaller multicab. Do not worry if you do not have your own PFD. 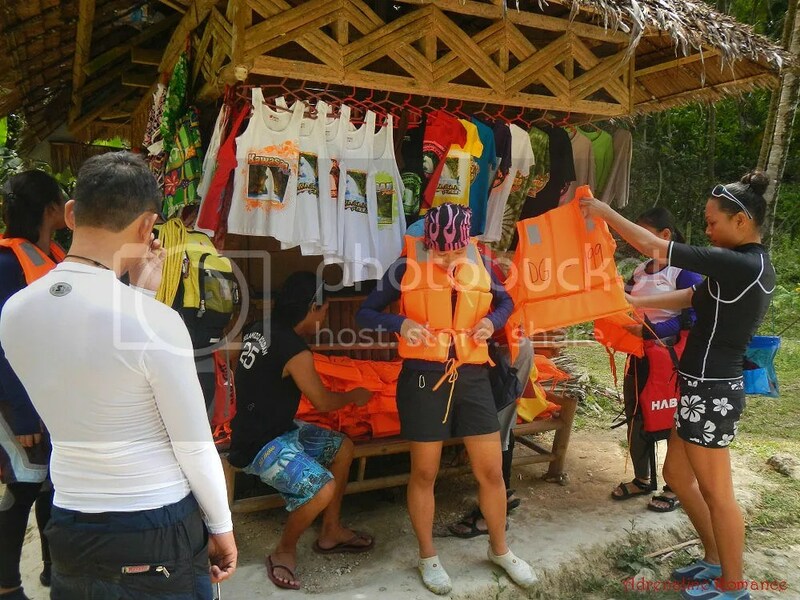 On the way to Kawasan Falls, there’s a small souvenir shop where you can rent a PFD at a very reasonable price. For safety, we recommend you rent a PFD even if you’re a strong and capable swimmer. 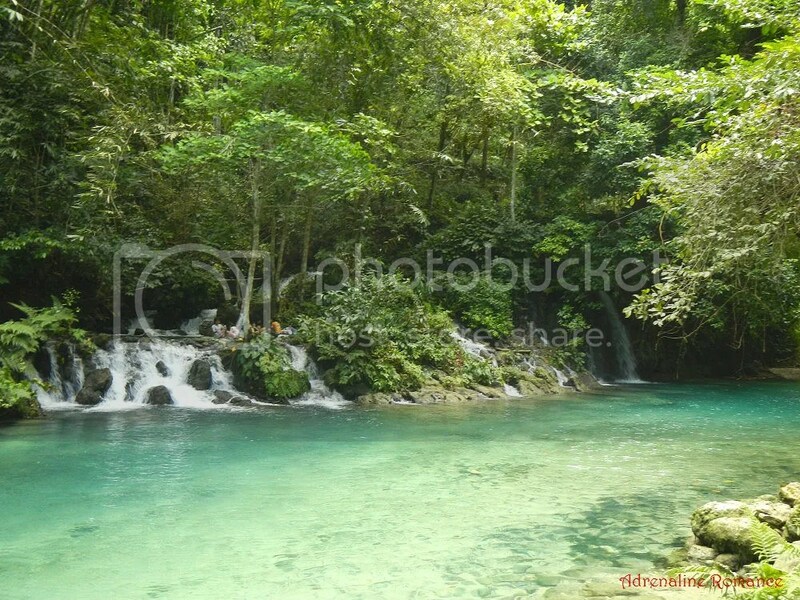 After a few minutes, we reached the first and primary waterfall of Kawasan Falls. 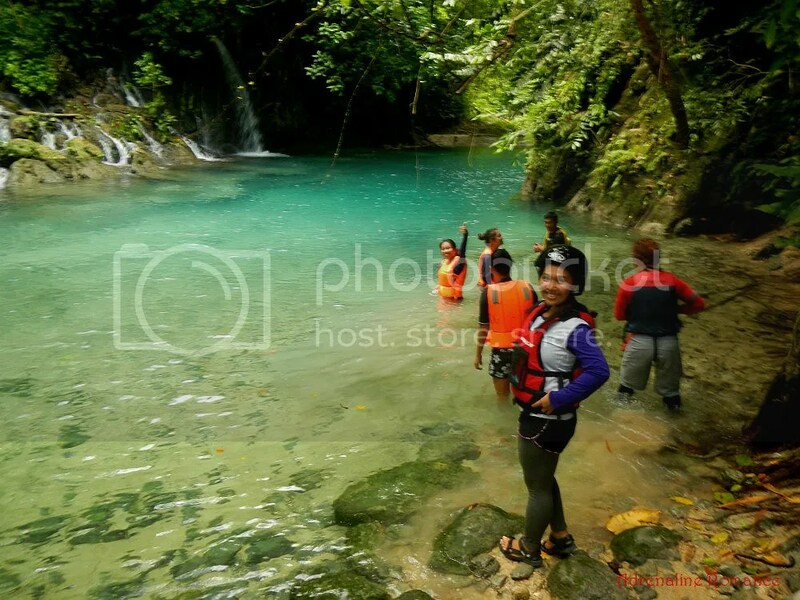 With the ugly huts and structures built right before the waterfalls demolished under the order of then Governor Gwen Garcia, Kawasan Falls looks more majestic than ever. 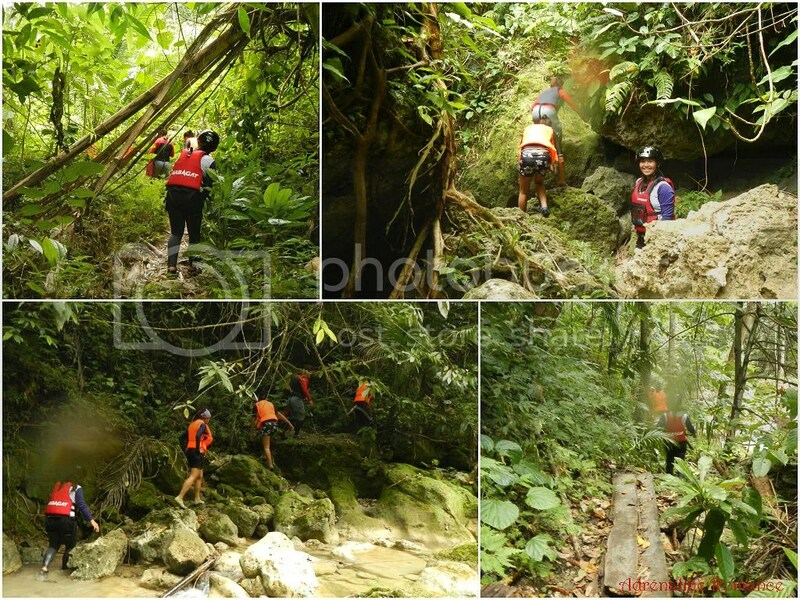 After taking a few photos of one of Cebu’s most famous waterfalls, we warmed up by hiking uphill to Station 3, which is the actual jump-off for our upstream canyoneering activity. 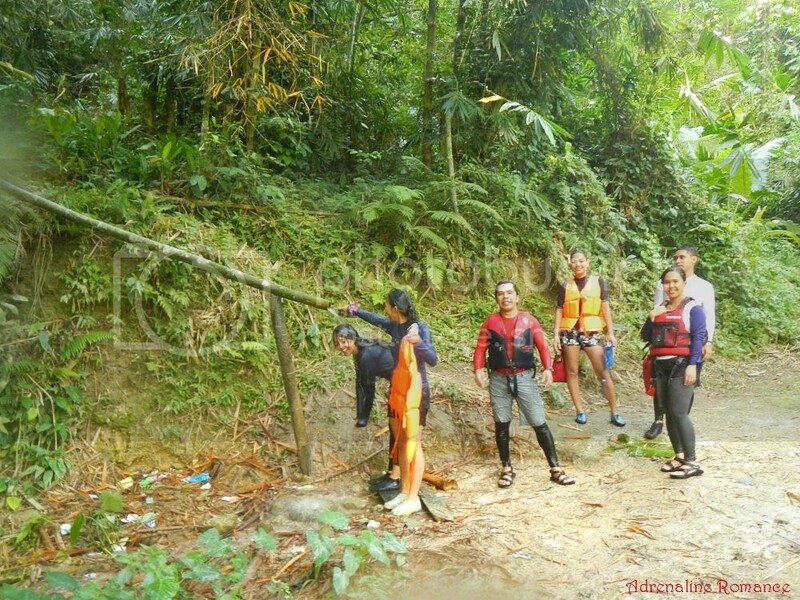 Along the way, we witnessed pristine streams, splashing waterfalls, verdant jungles, and clean trails, serenaded by cacophony of songs of forest birds. But we also saw sad and disconcerting evidences of man’s carelessness and cruelty to Mother Nature. 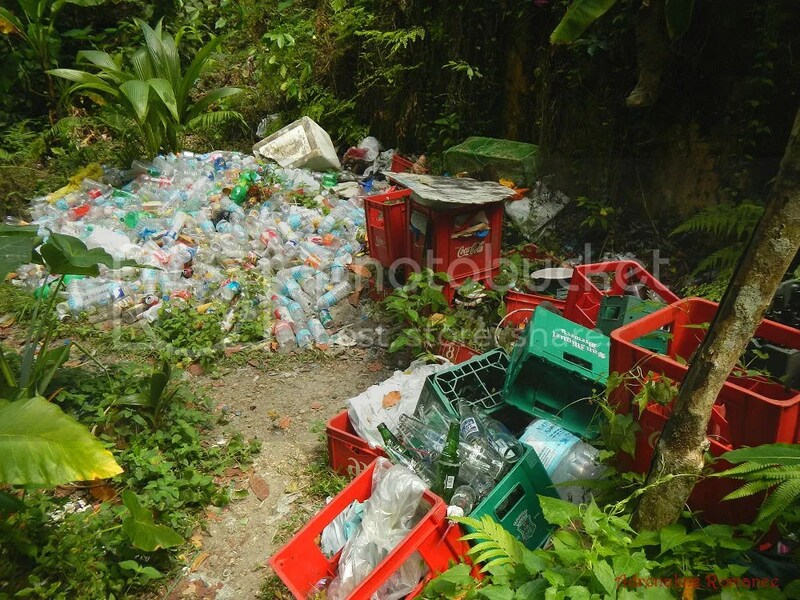 These plastic bottles and cases are piled up together and will be properly disposed by the caretakers of the falls. We should be mindful of our trash so we won’t make the place an ugly sight. 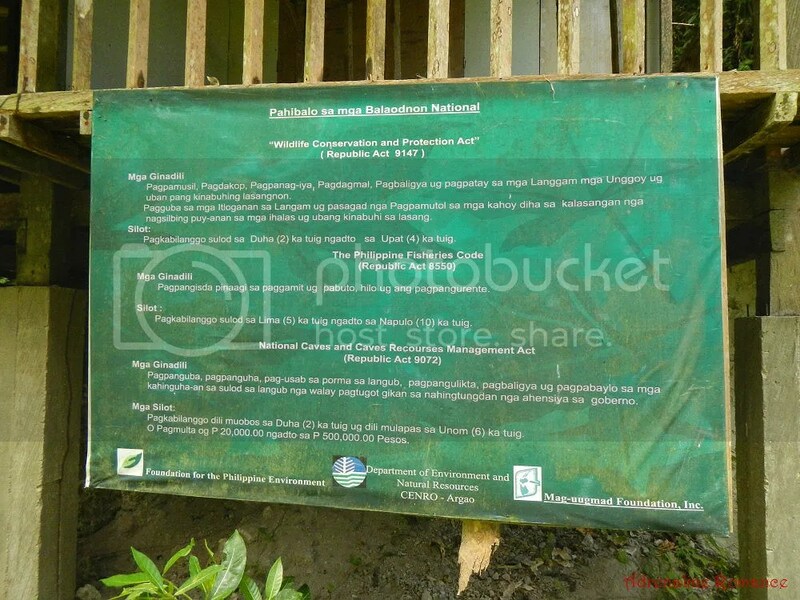 After half an hour of brisk, easy hiking, we arrived at Station 3, purportedly the source of Kawasan Falls water. 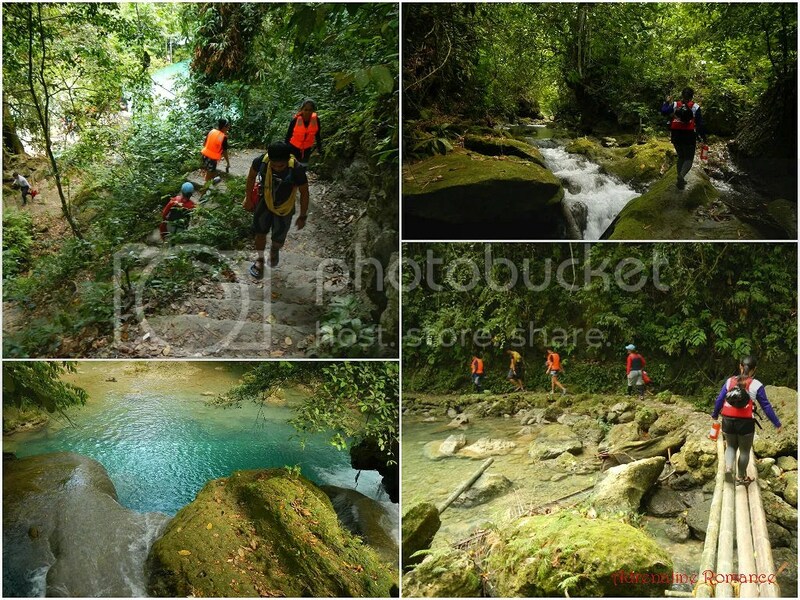 This is also the usual exit point for local mountaineers doing an Osmeña Peak-to-Kawasan Falls traverse. Check out the cool, clear, clean water. It’s impossible to resist jumping in it! Sir Ya Man briefed us on the route, the challenges that we expected to face, and techniques we needed to use. We also set our team and member positions and made a safety check on each other. After a short prayer, we were all set and excited to start this extreme adventure. Just look at the smiles on our faces! By the way, the water here is so cold even if the surface temperature is sweltering; it’s as cold as your bottle of chilled water in your refrigerator. With such low temperature, you can easily get a cramp, which is why wearing a PFD is advisable. The first challenge of this adventure was what Sweetie dreads the most—swimming in deep water! She paled as her foot lost contact with the riverbed. But as soon as I held her hand and assured her that she’ll be okay (she’s wearing a PFD), she began to smile and laugh despite herself. The other members of the team were amused by the fact that Sweetie was amused about her inability to swim! We surfaced at the far end of the river. We crossed and waded through the tributaries that flow through the main river. Even if we were still near our starting point, we needed to be careful because the rocks, covered with moist moss, were very slippery. One wrong move and one may end up with scratches, bruises, sprains, or worse, broken bones. Just because we were following a flowing river doesn’t mean we won’t get to high ground. 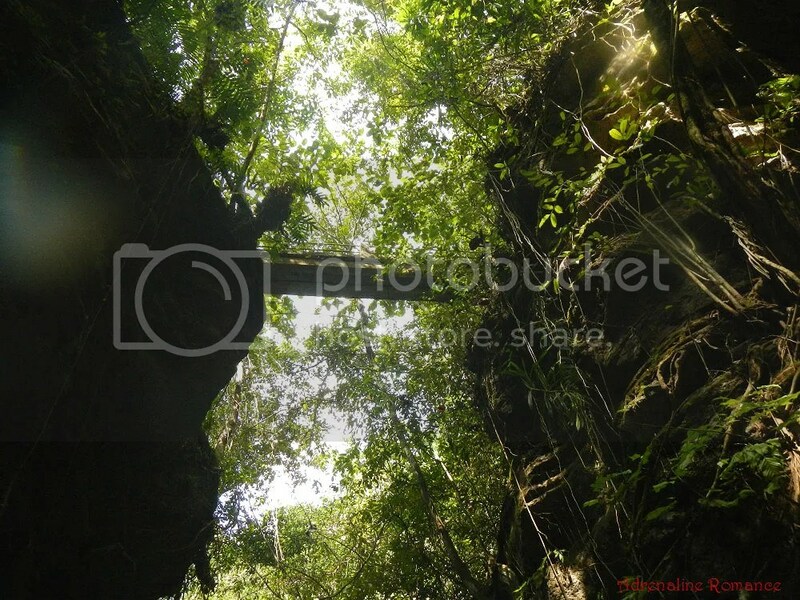 We also went inside the canopies of dense jungles. Even at this early in the adventure, we realized why canyoneering is such an exciting and fulfilling sport. 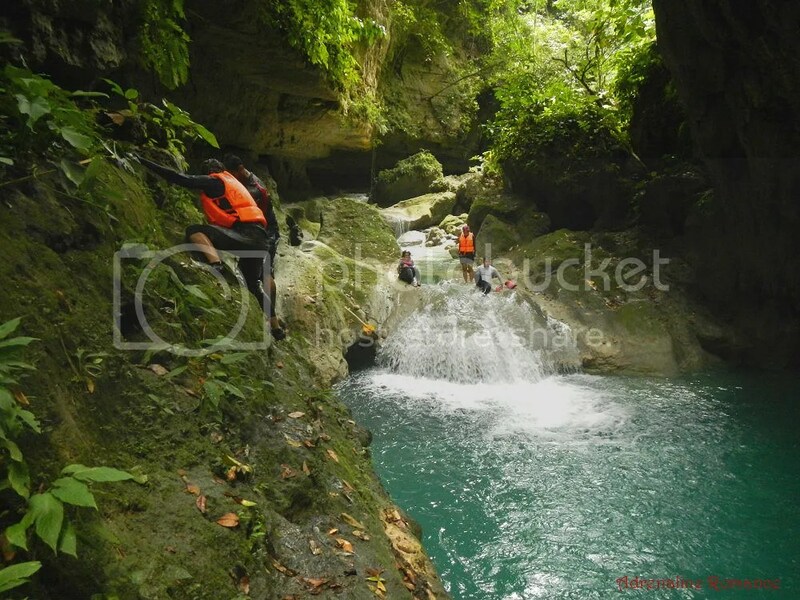 Canyoneering encompasses every activity you do in the outdoors—trekking, swimming, climbing, scrambling, etc. One of the best things about being in the outdoors is that we get to see very interesting wildlife. 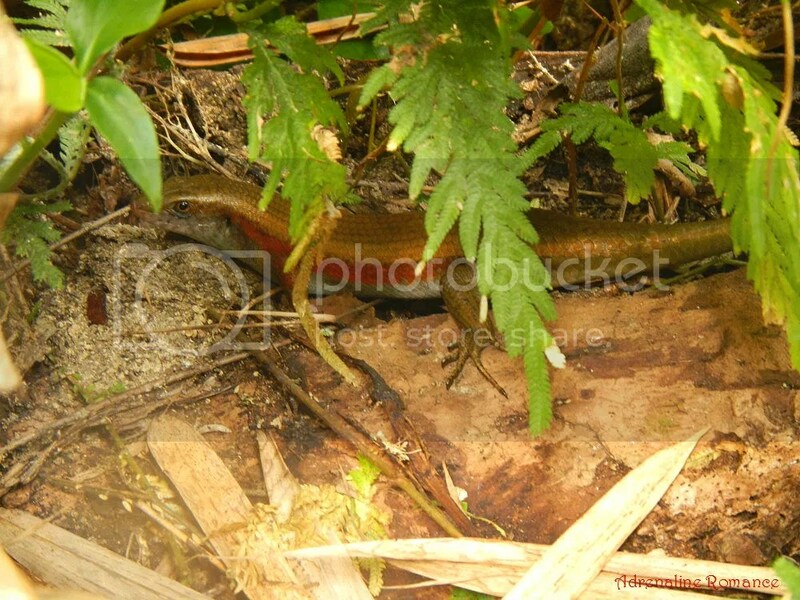 We found this large, colorful lizard, locally known as tabili, hiding under a cluster of leaves. We kept a safe distance and refrained from disturbing although he didn’t seem to be bothered by our presence. Along the way, we also chanced upon this local contraption. Sir Ya Man told us that this is used to smoke coconuts to make copra. Pieces of coconut meat are placed on the bamboo “tray” while scraps of wood or coconut husks are burned below it to produce smoke. After being smoked and dried, coconut oil is extracted from the dried meat. That oil is then used as an ingredient for soap, shampoo, moisturizer, alternative fuel, herbicides, engine lubricant, and more. The dried meat is used for fertilizer and cattle feed. In some areas, the river is just shin-deep. In others, waist deep. But in others, we needed to swim. Finally, we arrived at a place where gigantic moss-filled walls of rock rose on both sides of the river. 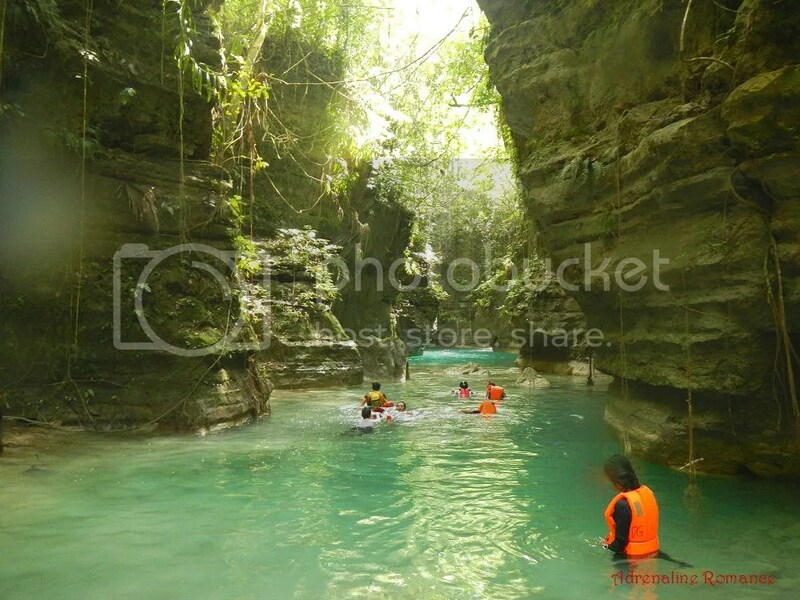 We arrived at the mouth of the Matutinao River canyon. Sweetie and Apol helped each other navigate this slippery section of the canyon entrance. 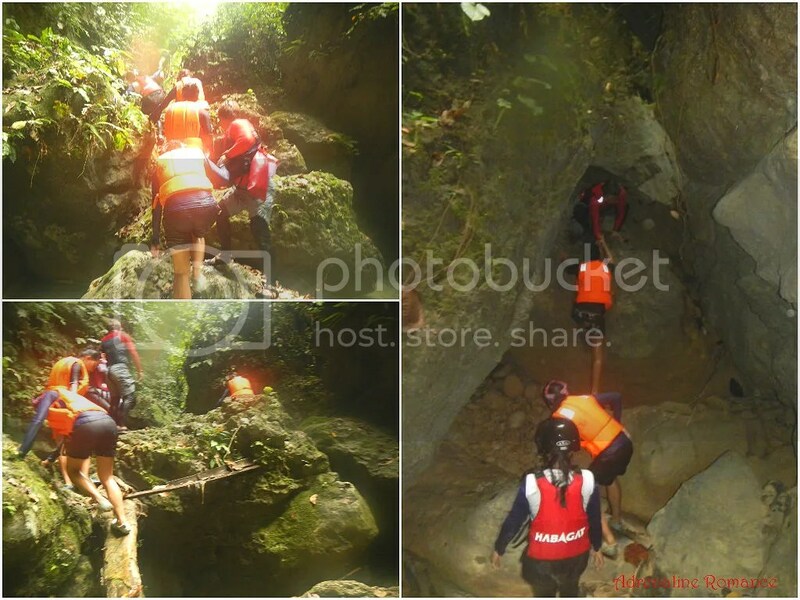 Teamwork is definitely needed here both for safety and to complete the entire adventure. Up ahead, the fast-flowing river disappeared into the thick forest. We had this eerie feeling that we were the only people here, yet somebody…or something…was watching us. Further down the canyon are large basins of deep water. To move forward, we needed to fight against the current. At this point, the current was still relatively weak; but we can definitely feel it pushing us towards the canyon’s entrance as if the river does not want us to see her secrets. It was as if she’s saying, “You want to see my wonders? Then you have to fight for it.” That was what we just did. 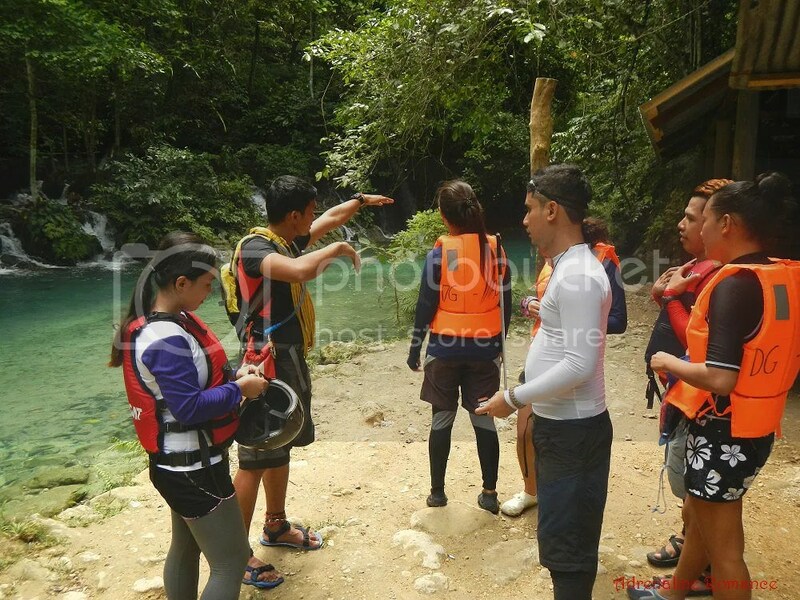 Sir Choy, another guide and our sweeper, made sure that everyone is all accounted for. That’s where we came from—the entrance of the canyon as seen from the inside. Gorgeous, isn’t it? Just check out that cool, clean water. 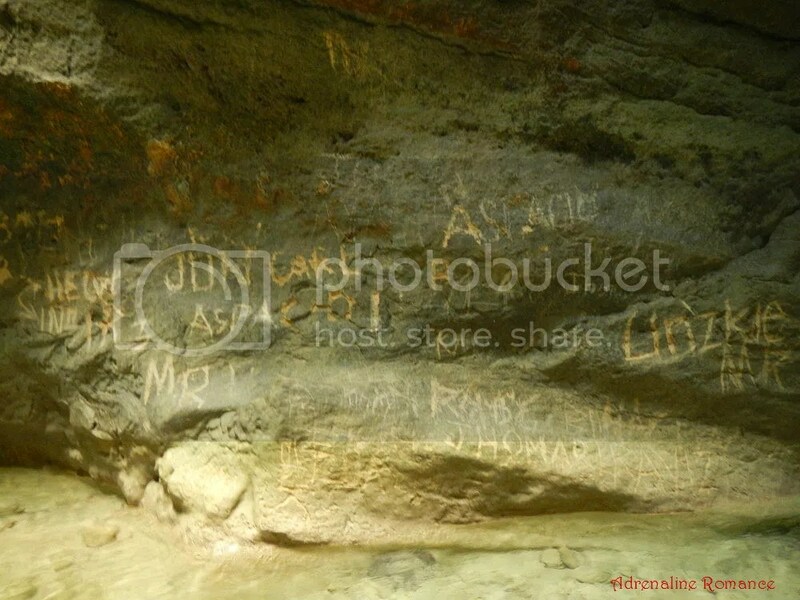 But at the same time, we were dismayed at the presence of graffiti scratched into the delicate rocks. We couldn’t believe it; even in this remote, almost inaccessible part of the forest, irresponsible people still find the time and risk their lives just to make a statement for themselves. People who did this ought to be jailed and fined. 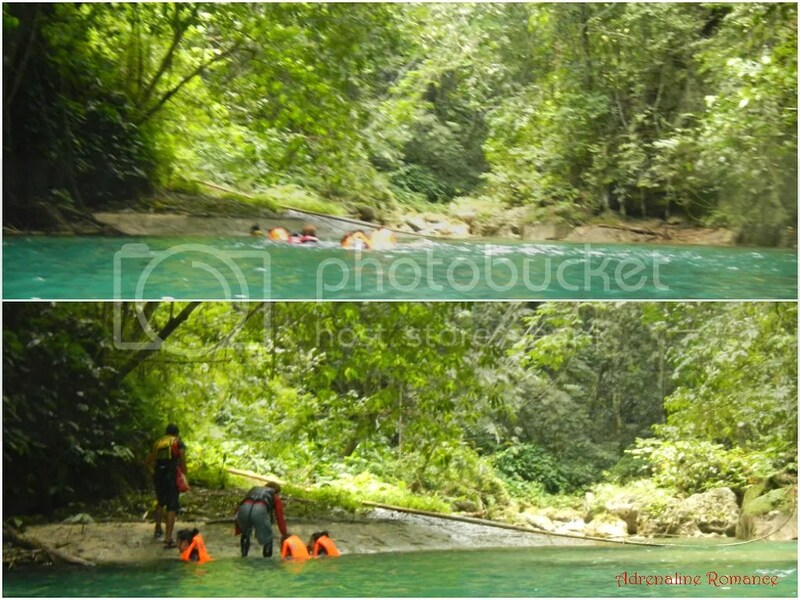 After several minutes, we dipped and swam in a deep channel of water with a fast-flowing, really strong current. It’s so strong that trying to swim against it is futile; you can swim all day, and you still won’t move an inch. Complicating things was that there are no riverbanks here; it’s rock walls all the way! 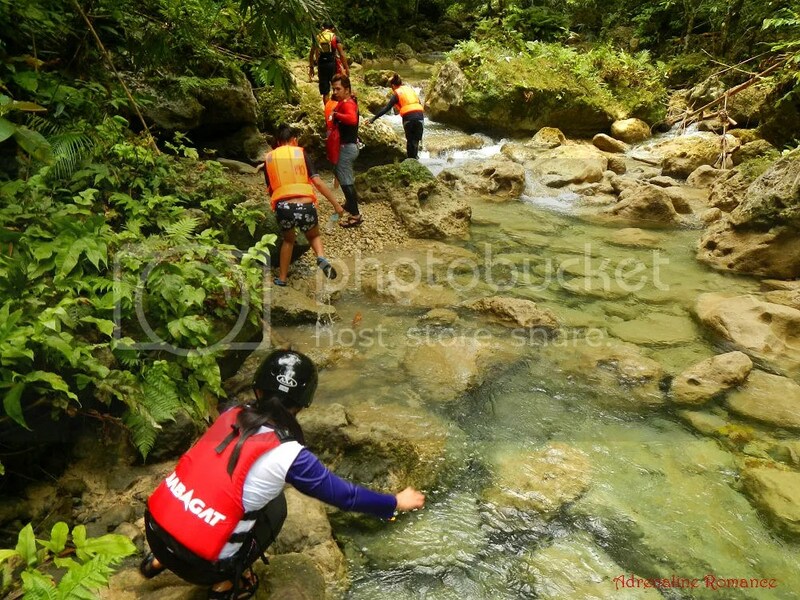 The only way to successfully pass through this section was to swim to the very edge of the river, right beside the rock walls. The current here isn’t as strong as that in the middle, but still, we had to put up a good fight. Our goal is to go through that hole in the distance under that wedged rock. The “weak” current is actually a misnomer; it is still immensely strong. We needed to hold on to stalactites, outcroppings, and pockets to avoid being swept away and to help us move ourselves forward. It required a lot of effort, but as you can see in the photo below, everyone seemed really happy to take this challenge. One by one, we went through the hole and witnessed the source of the current, a small but powerful waterfall. 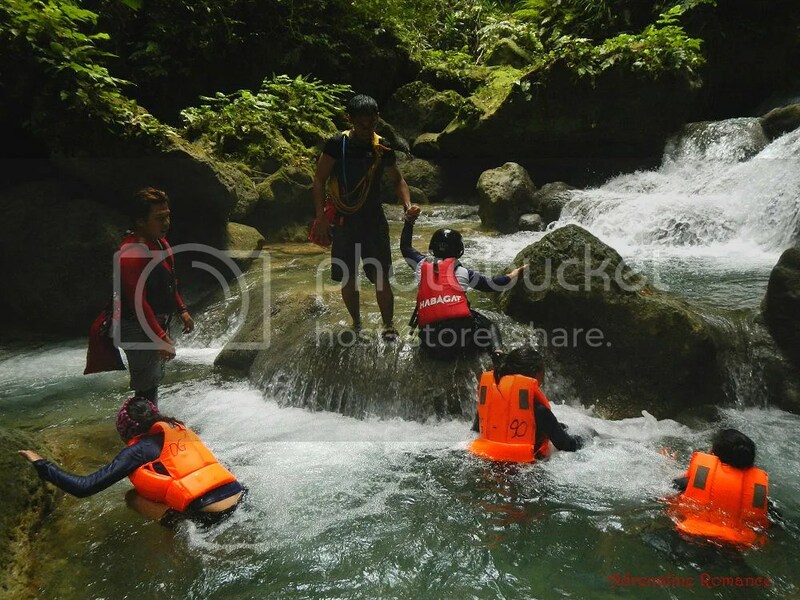 After everyone was through, it was my and Sir Choy’s turn to climb this waterfall. You can see in the photos below the fight that we have to undertake. We needed to climb against the waterfall itself, which took considerable chunks of our strength. 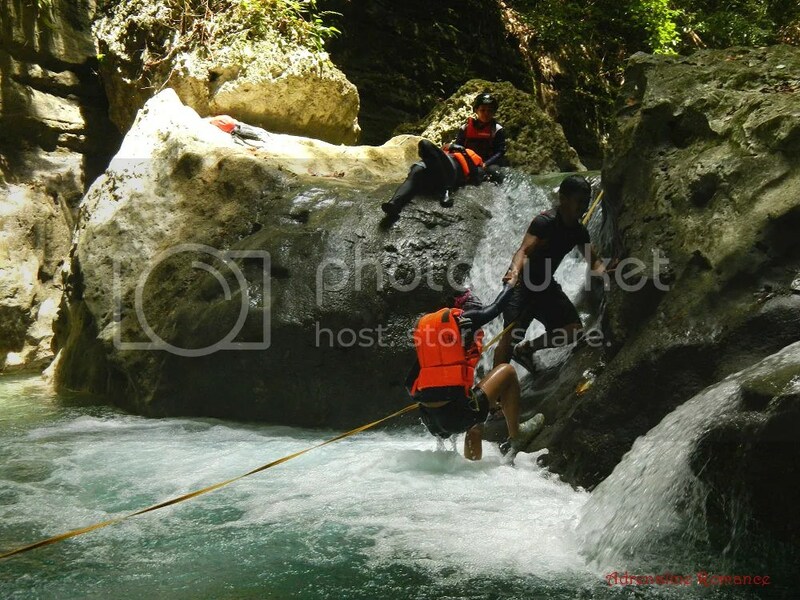 It is difficult to hold or step on the slippery rocks and crevices while climbing against the strong current. That’s what we call a challenge! Everyone was all smiles knowing that they just battled a waterfall. We can never win against nature; we can only attempt to meet her challenges and survive. 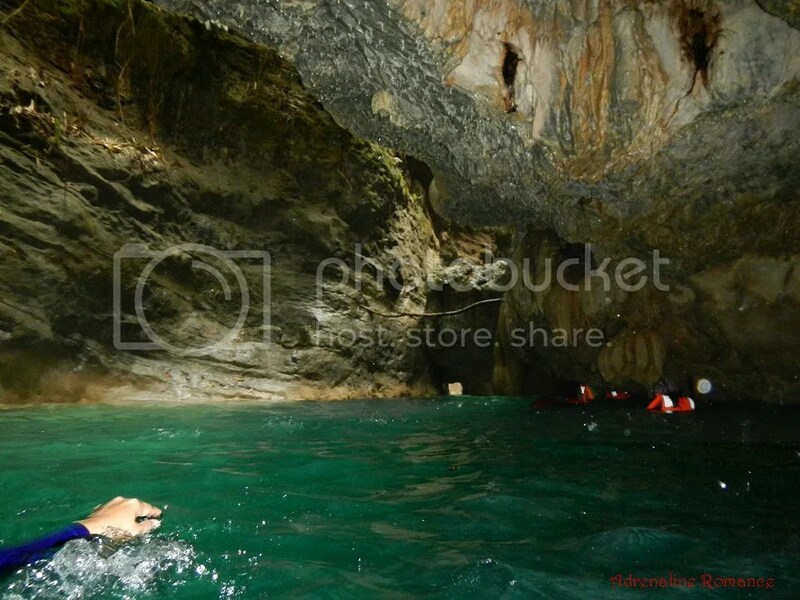 Oh, and we realized one thing: canyoneering is extremely fun and challenging! But the challenges were just starting. Just a few minutes away from that powerful waterfall is another deep channel which we have to swim through. To escape an even stronger current, we stayed at the edges of the canyon under that rock overhang. 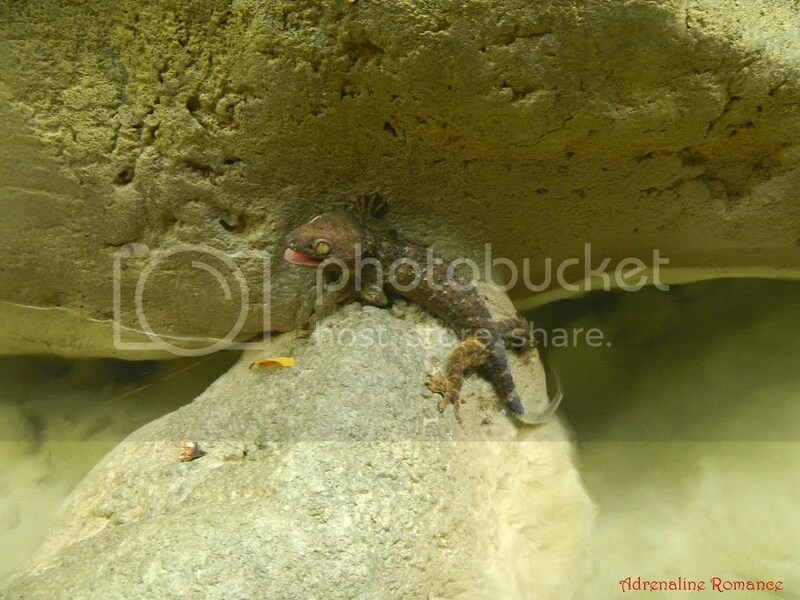 Check out the photo below to have an idea of what we saw in that canyon. That water is many fathoms deep; say goodbye to whatever you drop here. The echoes of the rushing water from the nearby waterfall seemed very eerie in this place. 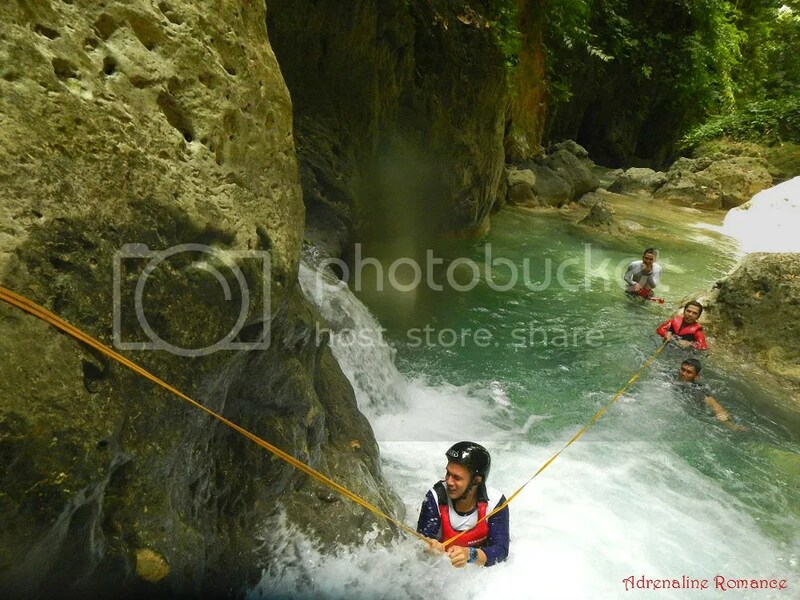 You can see from the photo below that Sweetie was having fun despite swimming against the current. Also, check out the other adventurers; they had to stay at the edge of the canyon to avoid the strong current from sweeping them off. Yes, we came all the way from there and left Station 3 far away. As you can probably see, if we went downstream, there’s no other way to go than to jump through these waterfalls! Awesome! Sometimes, huge trees from above the canyon fall into the river. In time, they get overgrown with moss. Be careful because they may look solid, but they’re actually rotten inside. 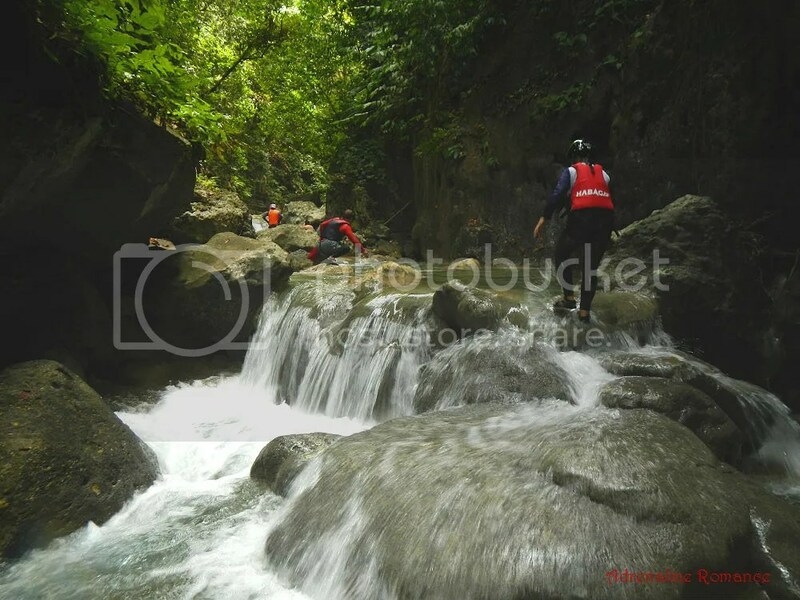 More scrambling over another of Matutinao River’s beautiful flowing waterfalls! Mother Nature is simply amazing—it is both serene and powerful at the same time. Navigating through this incredibly beautiful canyon made us feel tiny and insignificant; we were totally exposed and vulnerable to Mother Nature’s whims. However, we also felt the waters wash away the doubts, sadness, confusion, and stresses that we have harbored in our souls. It was all worth the fight and effort. 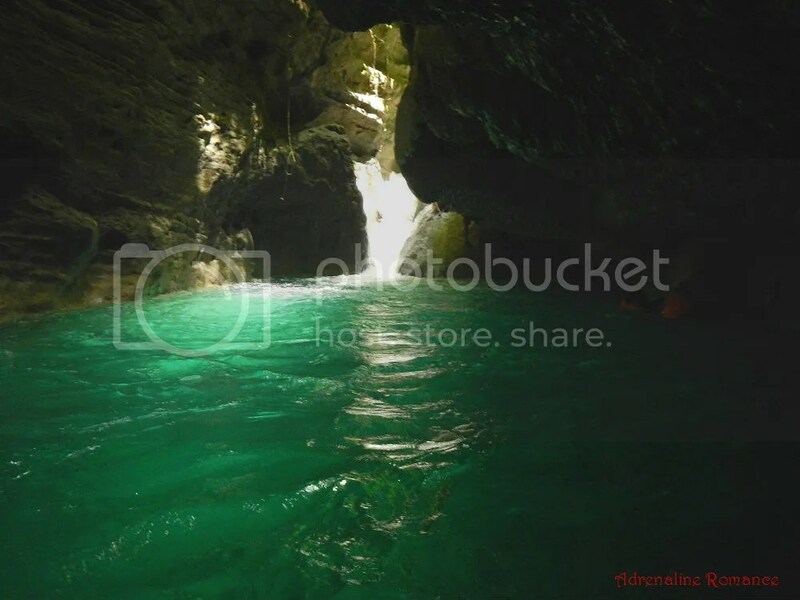 We were rewarded with the most amazing vistas deep inside the bowels of Badian. This is one of the trickiest challenges of the canyon, which is why a rope was laid out. You see, that waterfall is quite strong and the underwater ledges are quite low. That means water punches us right in the face! Complicating this section is the fact that the slope where the guide is stabilizing himself is quite slippery and sloping. 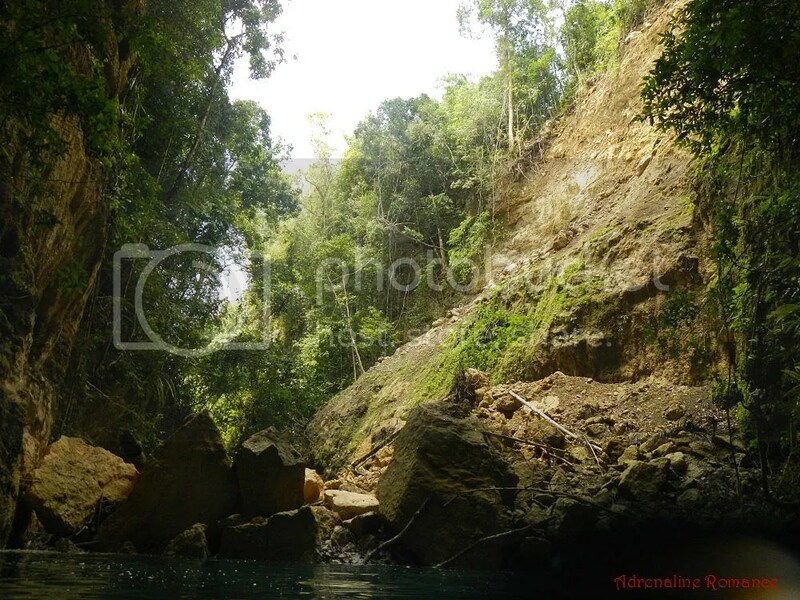 Finally, you need to swim across that lagoon to the waterfall; the water is quite deep. “I got you!” Teamwork is essential to successfully accomplish this challenge. 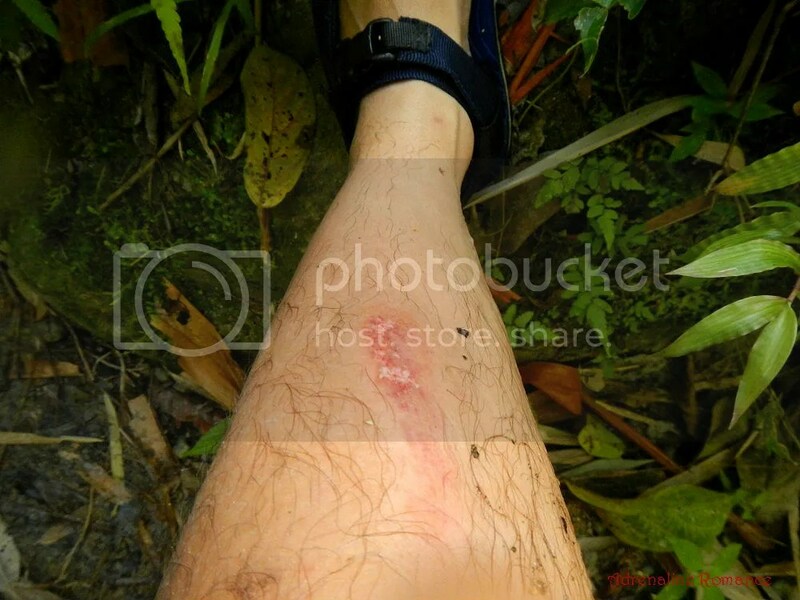 You can probably tell from the photo below what we have to contend with—a very strong curtain of water channeled through a deep lagoon through slippery rocks with almost no handholds or footholds. The video below shows you how we helped each other and negotiated this difficult part of the canyon. Oh, in case you want a spoiler: this is actually a blooper. Hehehe! We spent a few minutes catching our breath only to find out that just several minutes away was another series of waterfalls that we have to scramble on. Go, go, go! We still have plenty of fight left in us. We seemed to run on a great amount of energy coming from the fun, excitement, and determination to successfully come out of this adventure alive. We walked for quite sometime until we came to an area littered with huge boulders that fell from above the canyon. At first, we thought this was the ugly scar of a man-made excavation. 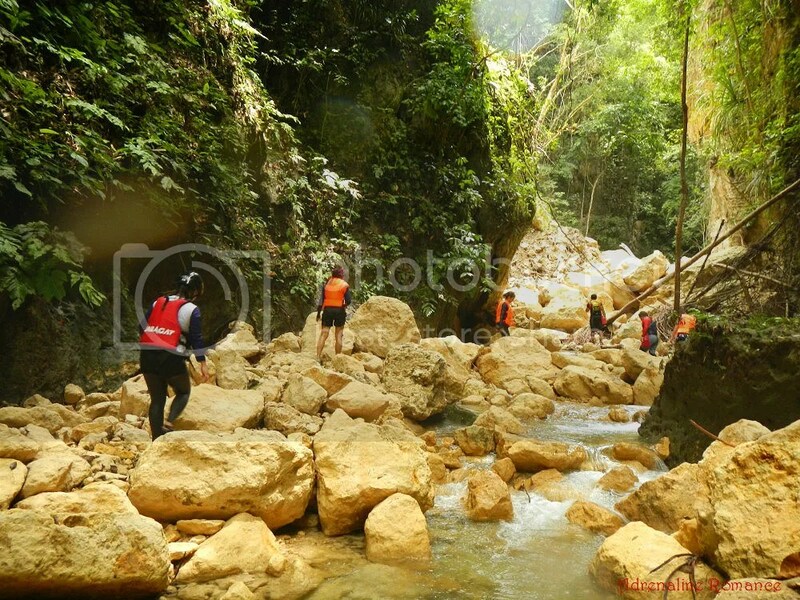 Just check out how big those boulders are, judging from the photo below. Even a glancing blow from a considerable sized falling boulder can actually kill a person. 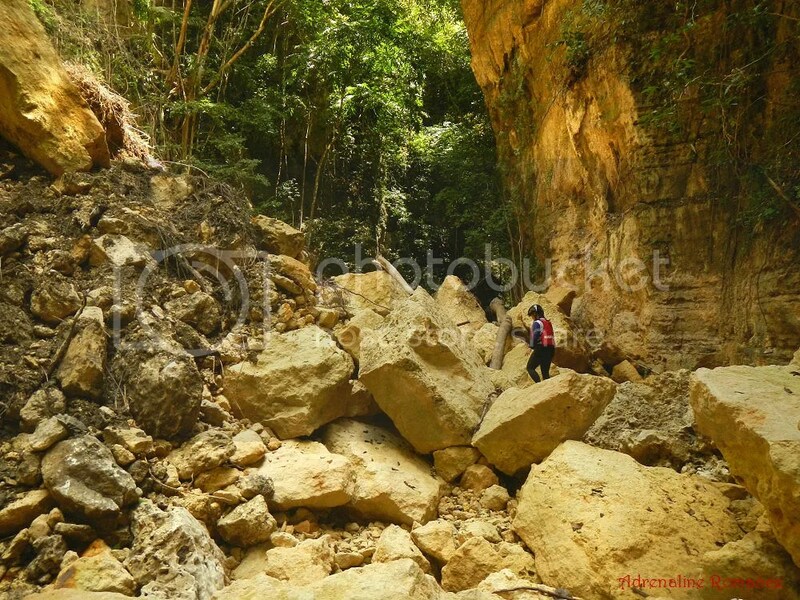 Well, those boulders are the remnants of a massive landslide that was triggered during the 7.2 magnitude Bohol earthquake, which occurred last October 2013. The sad thing was that the landslide covered the entrance of an immense cave that features a cathedral, rendering the cave inaccessible. 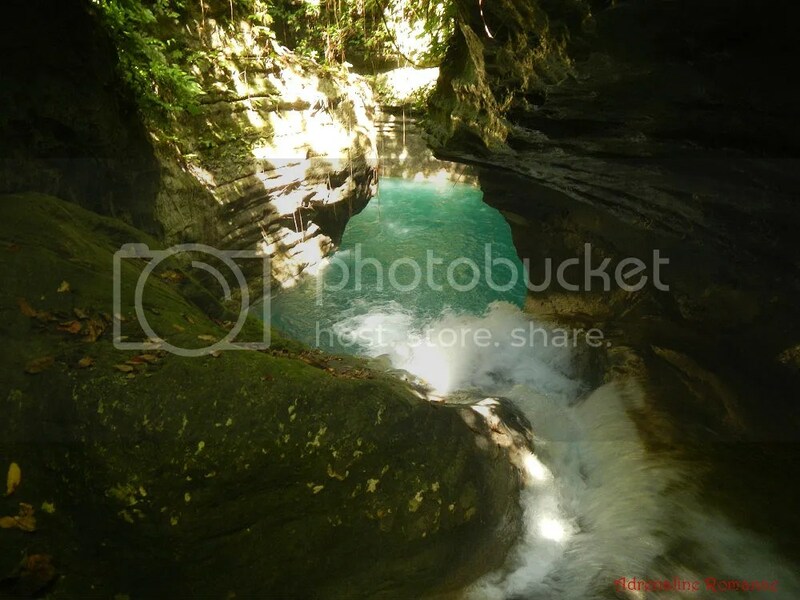 According to Sir Ya Man, the cave also had a stream and a small lagoon supplied by the river’s water. Just beyond the landslide is this deep channel of water. According to our knowledgeable guide, the water here was once just thigh-deep. 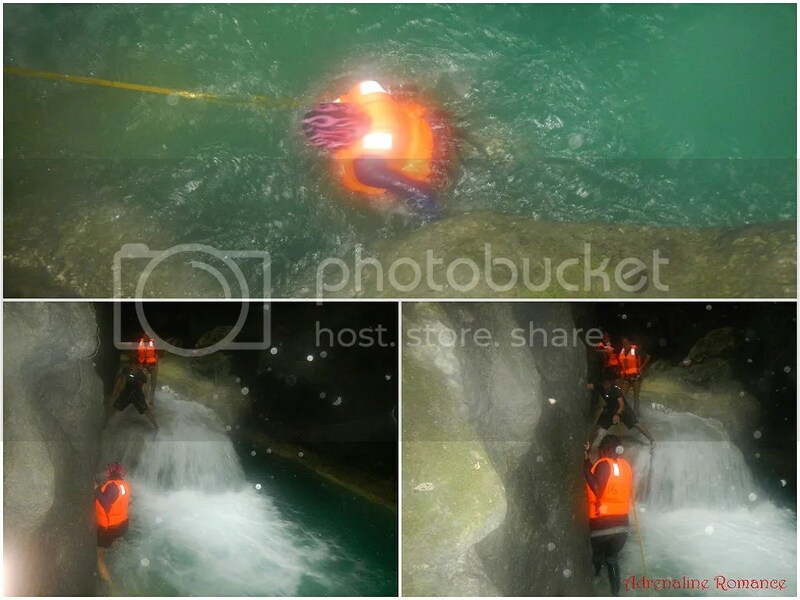 Now, people need to swim across it as the boulders from the landslide have plugged the water’s normal flow. We had a considerably long swim ahead of us, which gave us ample time to simply relax and float on the water. Along the way, we witnessed numerous large stalactites that line up the underside of the canyon. Stalactites are formed when deposits of calcium carbonate and other minerals, which are suspended in drops of water, harden as they drip down. In time, the deposits harden, causing stalactites to form. We also had to inch through slippery, moss-covered cliffs to go forward. Since the cliffs have very few handholds, Sir Ya Man established a line that people can use as a safety rail. That’s what the side of the cliff looks like. It’s a bit slanted so it’s relatively easy to traverse. Just watch out for the slippery sections. Lunchtime! 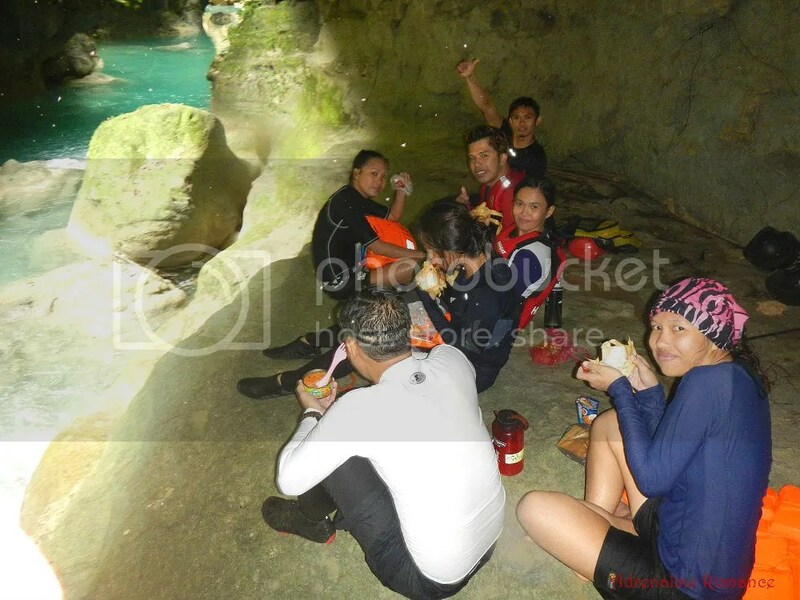 We ate a simple lunch under a canopy of rock that Sir Ya Man aptly called “The Cafeteria.” Strangely, the draft here is quite cool, and we were actually shivering in the cold air despite the hot summer day. After lunch, we had more trekking and scrambling up huge, mossy, and slippery boulders. We had more sections of the pristine river to traverse and swim through. And we had more mighty waterfalls to climb. We came upon this boulder-strewn section of the canyon where the water was so clear that you can actually make out individual boulders under the water. Sweetie’s first jump off a rock and into a river! Sweetie can climb immensely high cliffs, ascend tall mountains, crawl through dark caves, or trek through kilometers of rough trails. However, she’s always deathly afraid of water. In fact, she was very hesitant to jump even though she was wearing a PFD; I had to hold her hand and jump with her. Which makes you wonder: Sweetie’s okay with scuba diving several feet below the sea but is wholly afraid of jumping and swimming in a river even if she has a PFD on? Navigating through this gate of boulders required us to be vigilant of where we step on. That’s because the large rocks are super slippery, and one wrong, careless move can seriously injure any of us. 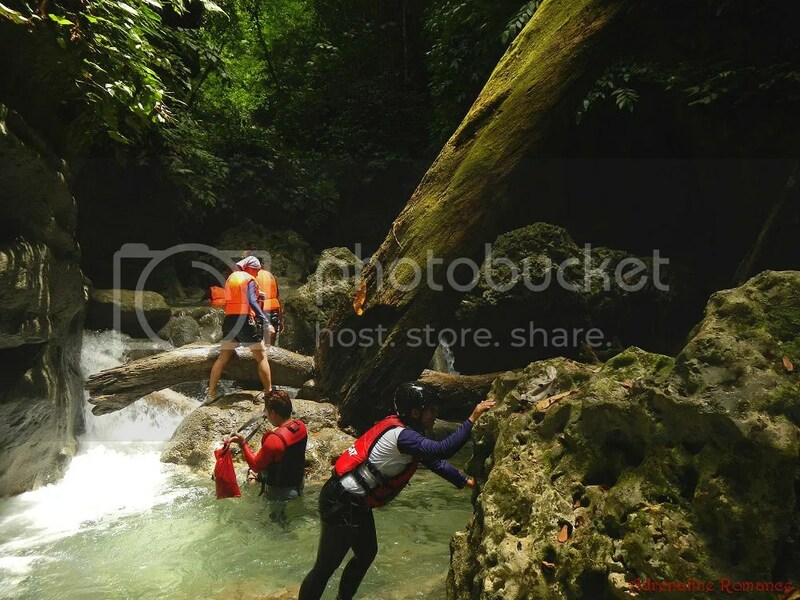 However, the constant element of danger is what makes exploring the wilderness full of thrill and excitement. That forest of large boulders was definitely a gateway. 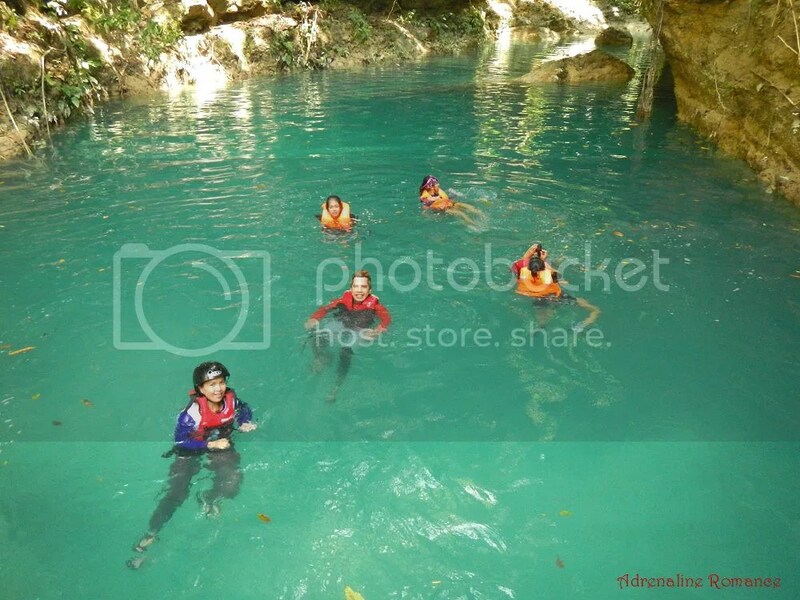 For beyond that, we saw this magnificent green lagoon surrounded by protective walls of rock. We were almost done with this crazy adventure! While floating peacefully in the lagoon, we saw this footbridge high above the canyon. It signifies that human habitation is not far away. Hello there, little gecko! Thank you for letting us explore your astounding home in the wild. 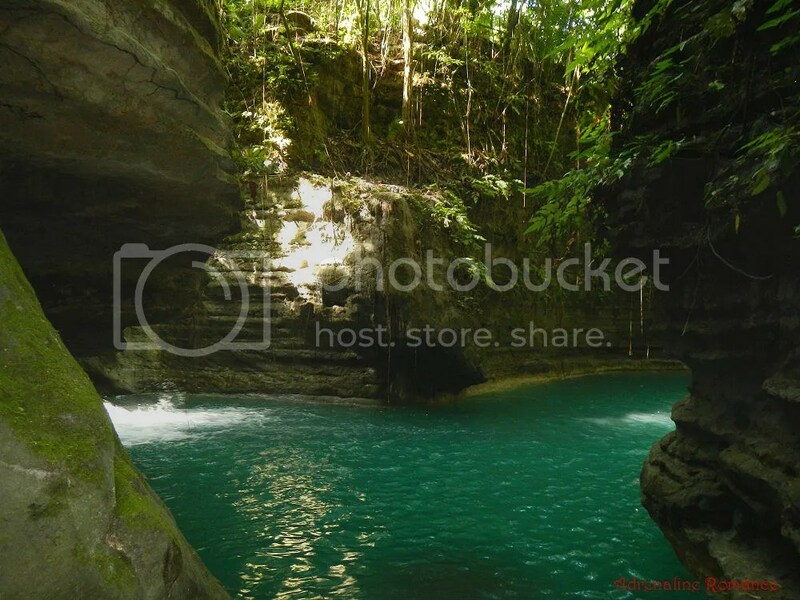 Don’t you just want to simply dip, dive, and swim in these aquamarine waters? That would be a very welcome balm to a hot summer day. This lagoon is called “The Dead End” and it marks the exit point of the canyon (or the entrance of the canyon if you’re going downstream). High diving is definitely the activity of the day here! We climbed that slippery cliff, holding on to the roots that trail on the cliff’s walls. After reaching the top, it was time to simply jump, enjoy the fall, and scream in exhilaration. As a final challenge, we climbed a tall and mighty waterfall that offers almost no handholds. In every step, we felt that the powerful flow of water is constantly, mercilessly trying to sweep us off our feet. That’s the view from above the waterfall. As you can see from the photo below, the powerful flow of water feeds the lagoon. 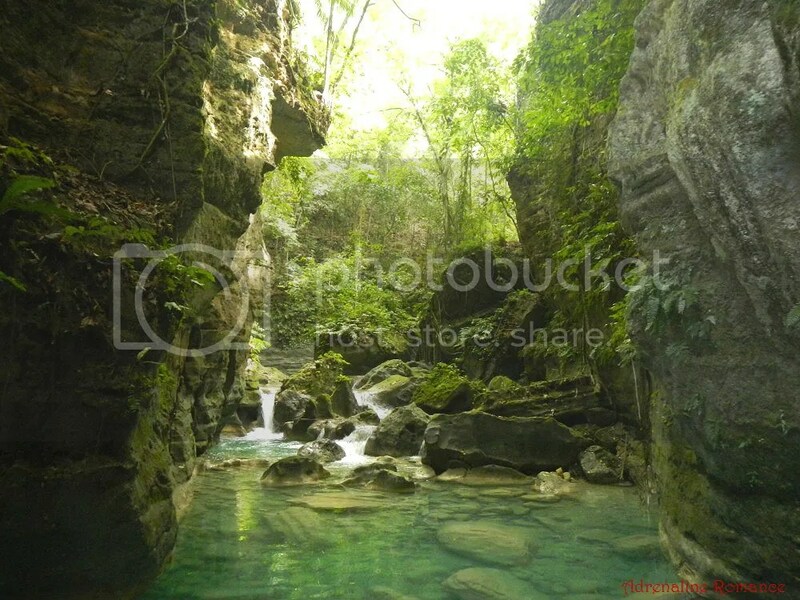 Yes, we know what you’re thinking and you’re right: it’s a lovely secret pool right there. 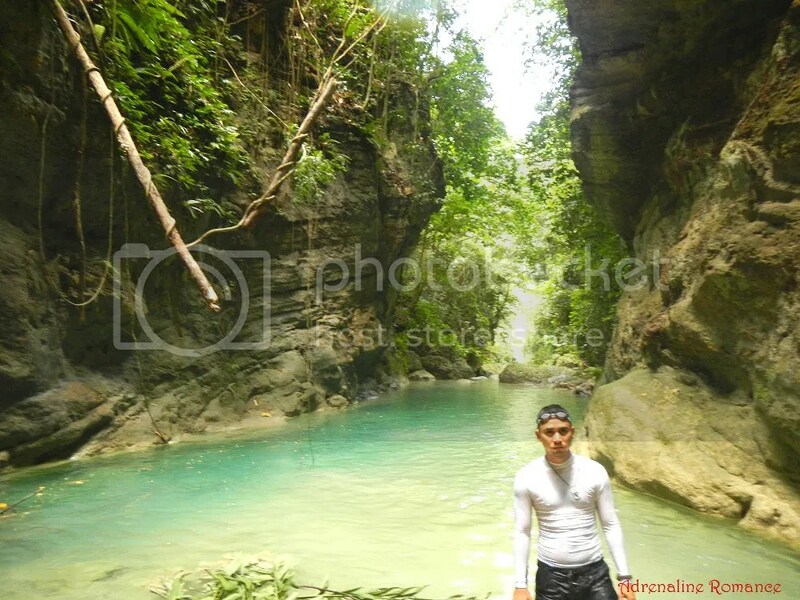 If The Fountain of Youth or the Pool of Bathsheba was real, then it would definitely be this unbelievably beautiful place. 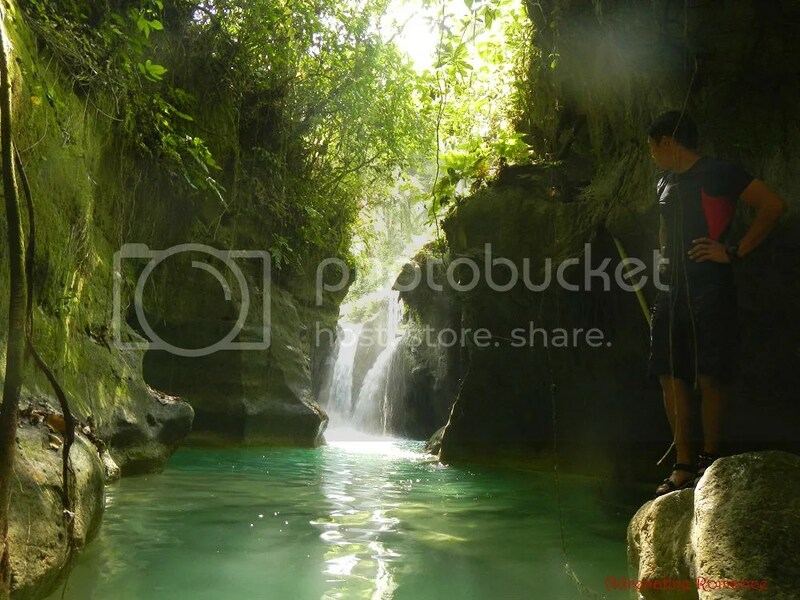 Beyond the waterfall is another powerful waterfall which is considered as the true source of Matutinao River and Kawasan Falls. After spending an hour frolicking in the chilly, clear water, it was time to go home. 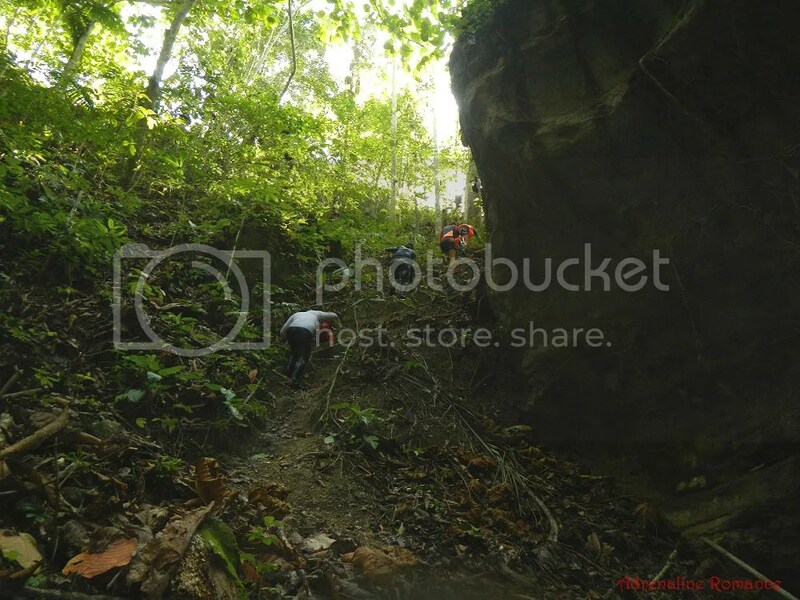 A steep trail from the bottom of the canyon goes up several meters to normal ground level. Here’s one final look at the exquisite, well-kept secret paradise we just left. 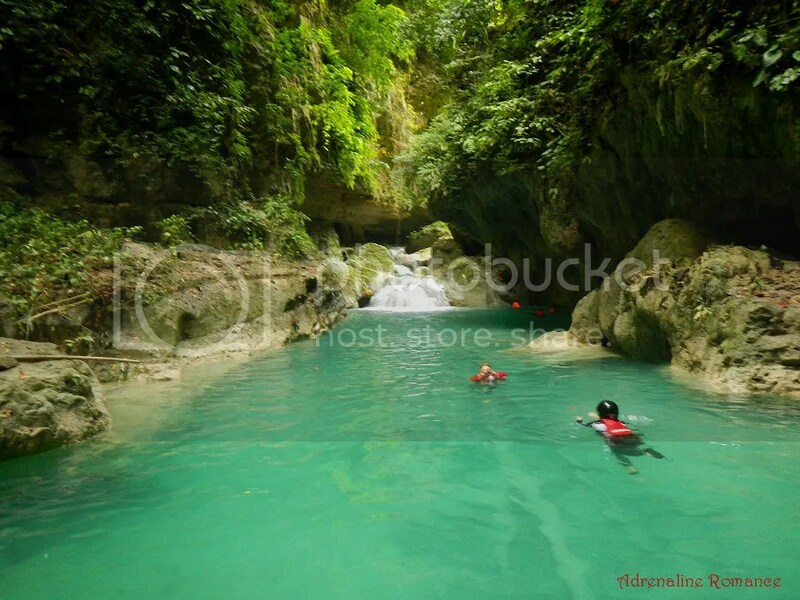 For sure, this will NOT be the last as we are planning another canyoneering adventure—this time, going downstream. 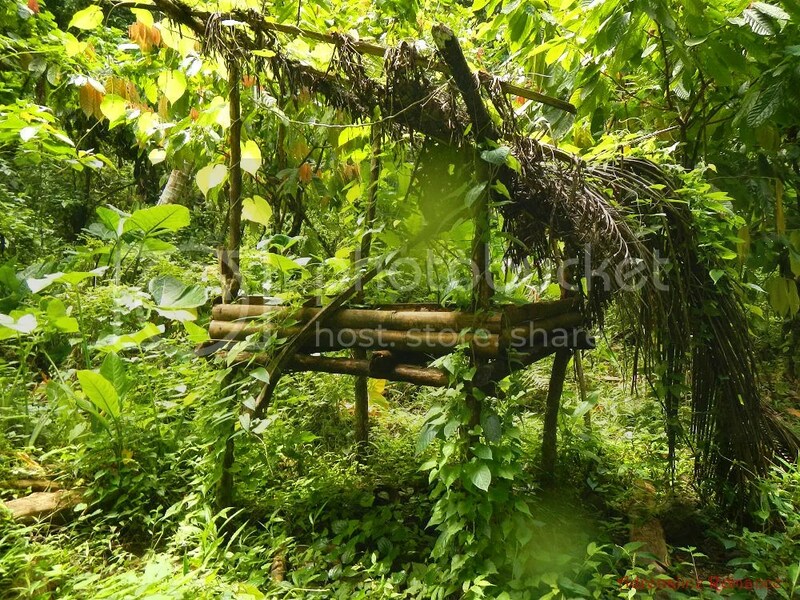 The presence of a bamboo tube which supplies locals with fresh water from a spring signals the end of our incredible adventure and marks the welcome to Barangay Canlaob in Alegria—and civilization. That’s my valuable souvenir for this adventure. Yes, expect bruises, scrapes, and cuts if you’re flat-footed like me. 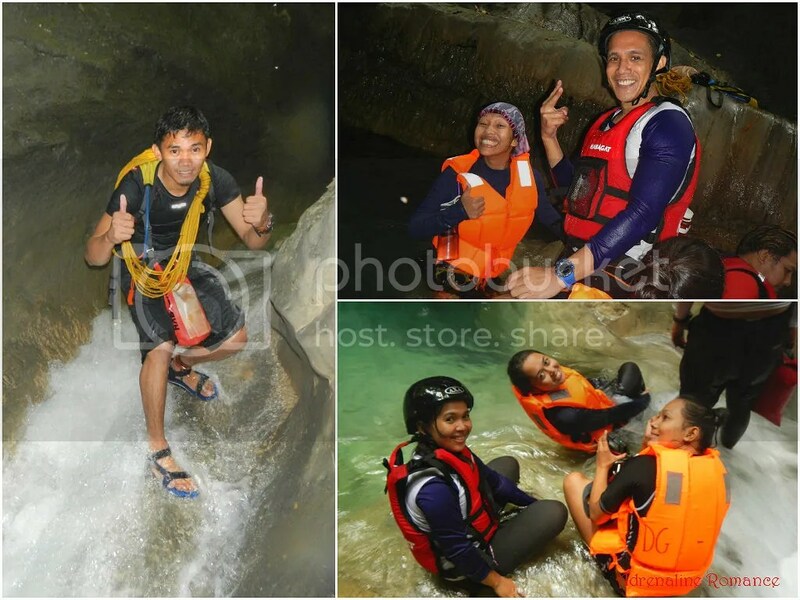 What an awesome canyoneering team! Thank you so much to Sirs Ya Man, Halourd, and Choy as well as to Ma’ams Apol, Mary Jane, and Lenny for bringing us here. 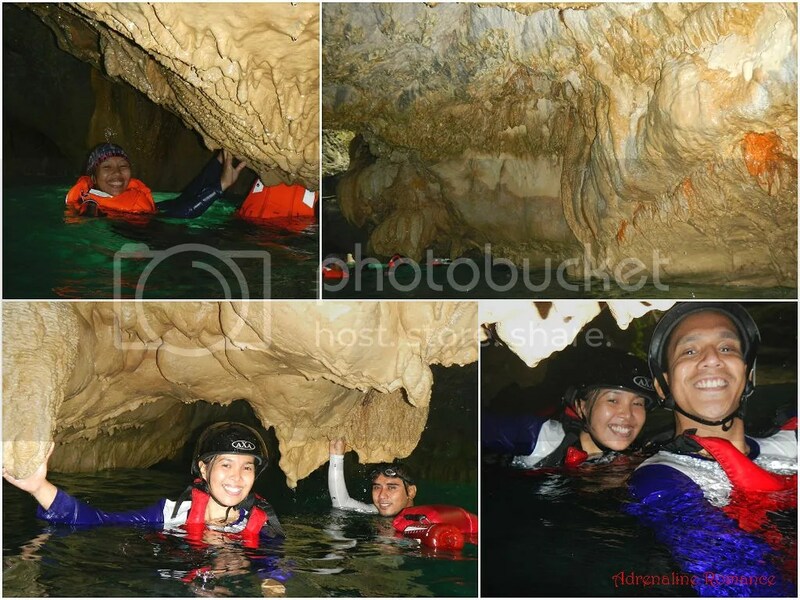 Truly, canyoneering through the ravines of Badian was one of the best, most intense, most exciting, and most adrenaline-pumping adventures we’ve ever had. We should do this again, guys and gals! 10:00 AM – arrival at Station 3, briefing, last-minute checks. * We did not include our expenses for meals, snacks, souvenirs, tips, and other fees in this rate sheet as you may have different needs, preferences, itineraries, miscellaneous transportation, and sharing scheme from us. Note that all figures are subject to change without prior notice. 1. 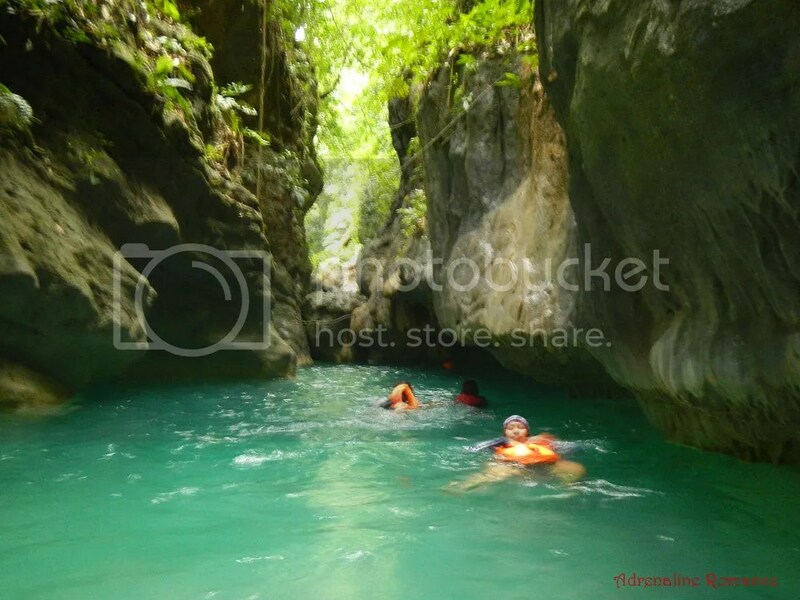 If you want to experience a convenient and hassle-free canyoneering adventure, contact Travel Cebu. 2. Always check the weather a few days before your canyoneering activity. 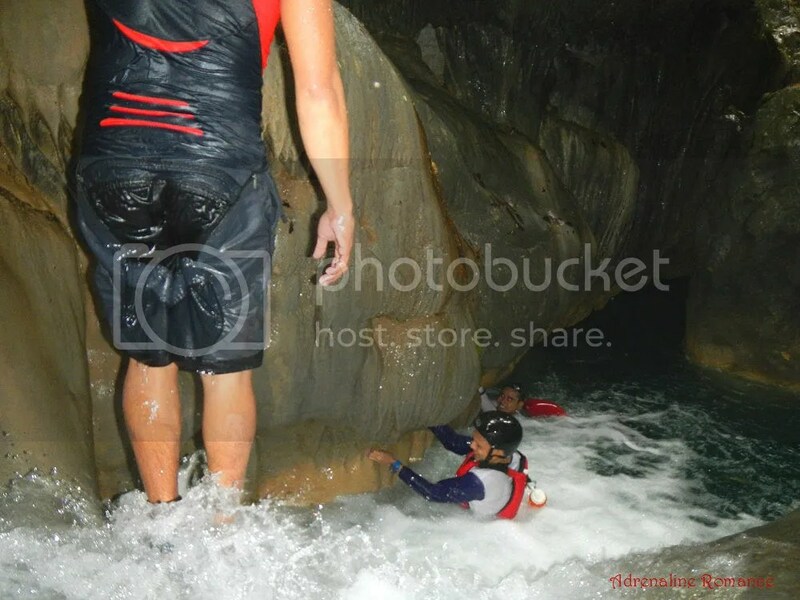 Never attempt to push on with your canyoneering adventure if the weather is bad! Even the slightest rain can generate flashfloods and extremely strong water currents that are life-threatening. 3. For safety, limit the number of participants in your team. Ideally, for beginners, there should only be 5 participants, 1 guide, and 1 sweeper in a group. 10 people in a group is the recommended absolute maximum. 4. For safety, wear a PFD (personal flotation device) or life jacket. Many parts of the river are deep and you’ll be constantly battling the current (if you’re going upstream). Thus, there is always a constant danger of drowning. Never underestimate the river even if you’re a strong swimmer and always be on the side of safety. Also, the water in the river is quite cold, which can make you more susceptible to leg cramps. That’s another reason why you should wear a life jacket. 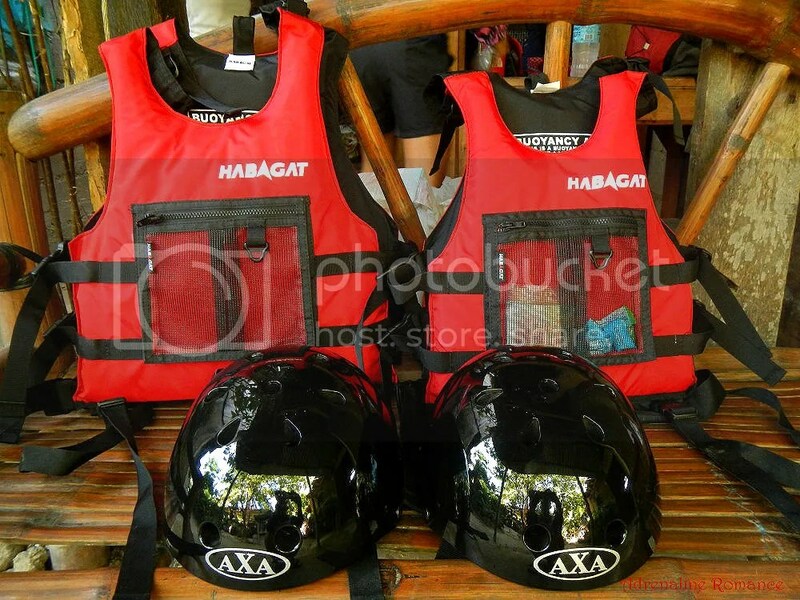 If you don’t have your own personal PFD, rent one in Kawasan for P50. 5. For safety, it is highly recommended that you wear a helmet. 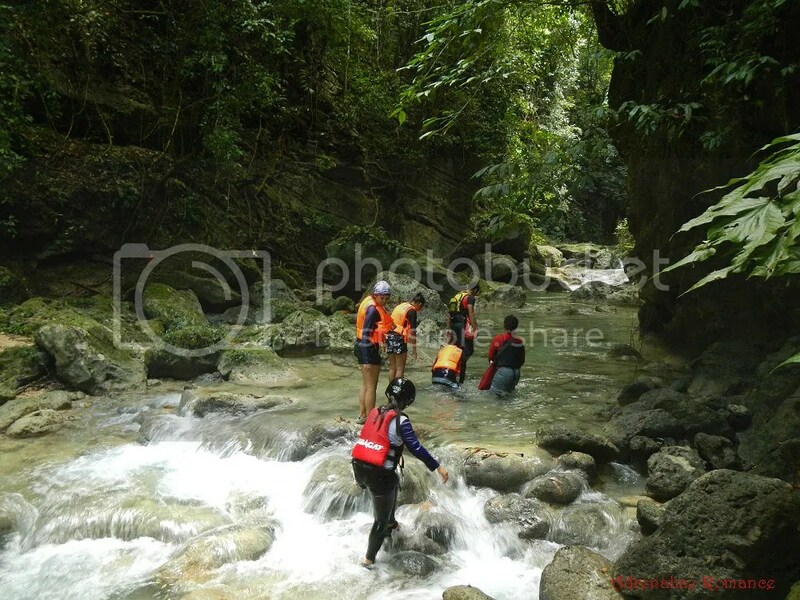 You’ll be climbing boulders, swimming under rock outcroppings, and jumping from heights. You need something to protect your head. A skateboarding or open-face motorcycle helmet will do just fine if you don’t have a proper climbing or caving helmet. 6. Going upstream is physically and mentally challenging since you have to hike uphill, climb waterfalls, and swim against the current. If this is your first time canyoneering, we recommend going downstream where you will go with the canyon’s lay and the river’s flow. In that case, you will start in Alegria rather than in Kawasan. 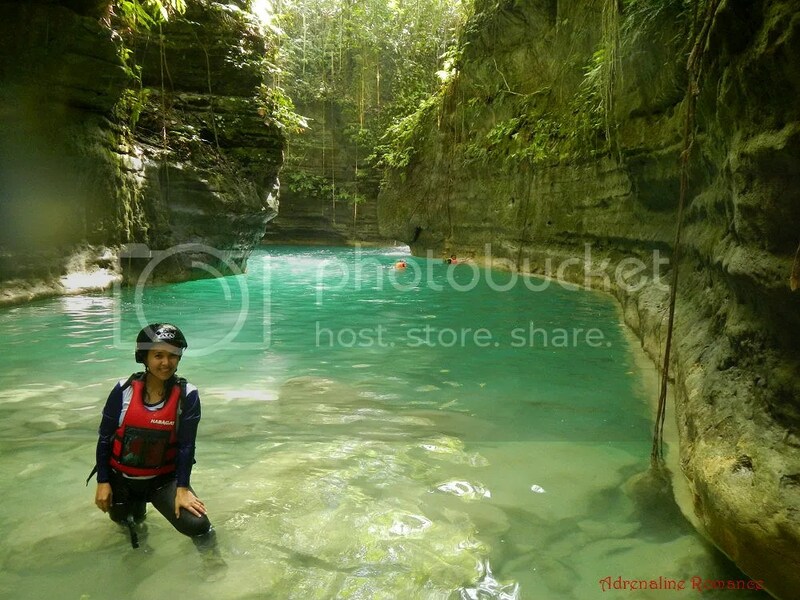 Read our blog post regarding canyoneering downstream. 7. For safety, if this is your first time engaging in ANY outdoor adventure, we recommend not to engage in canyoneering, especially going upstream. The sport is demanding and technical, and you may end up with regrets and frustration after realizing that a lot is required of you. Also, you don’t want your team to be constantly on the lookout for you; they are also working hard to tend to themselves. 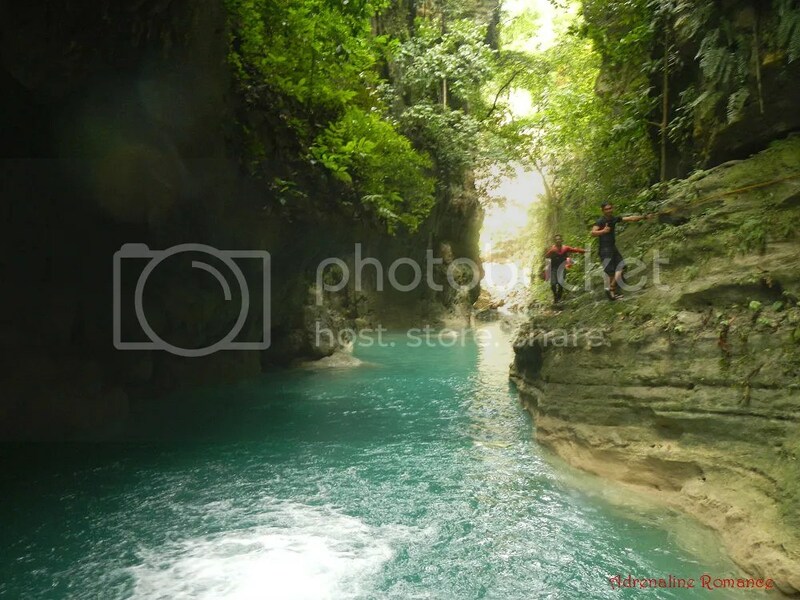 Finally, in canyoneering, you may be following a tight itinerary, and if you lag behind or if you constantly need supervision, then you’ll delay your schedule (this becomes dangerous if darkness begins to set in). 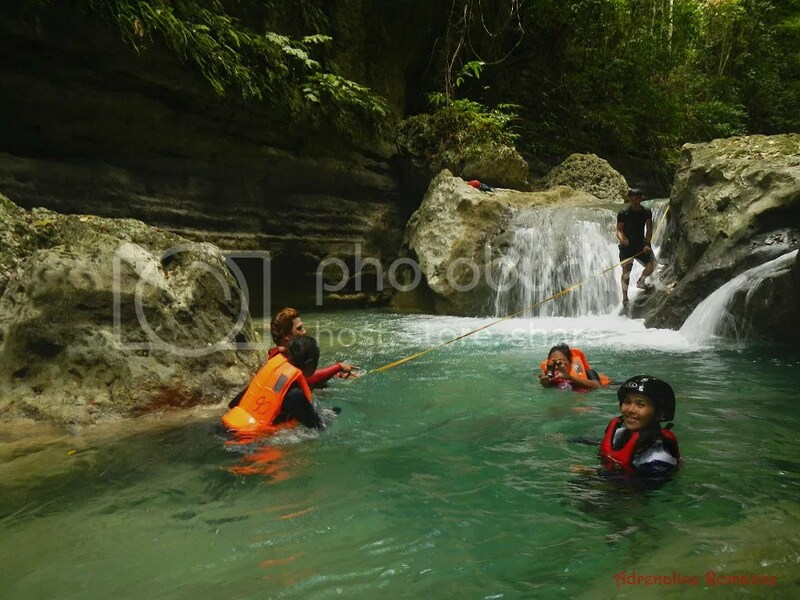 Thus, we highly recommend spending a bit of time gaining experience in other outdoor activities such as bouldering, mountaineering, and snorkeling. 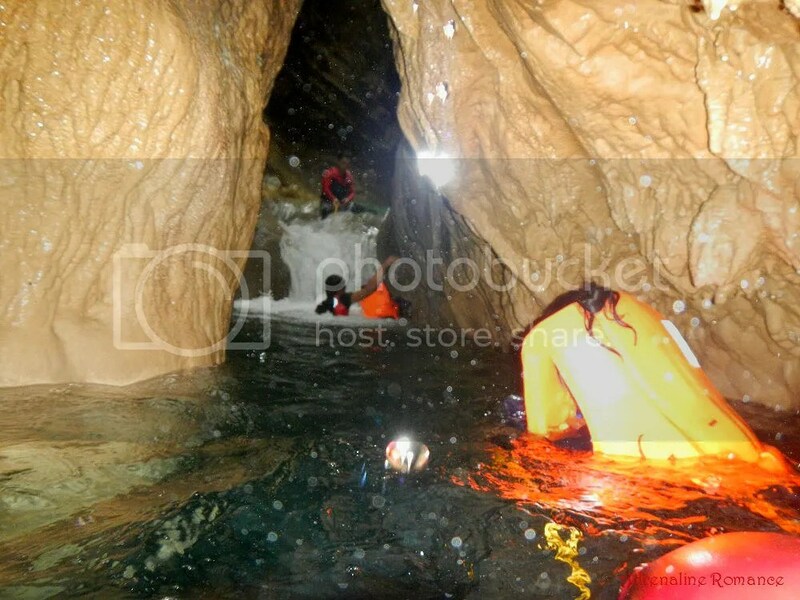 All of these activities are related to canyoneering. 8. 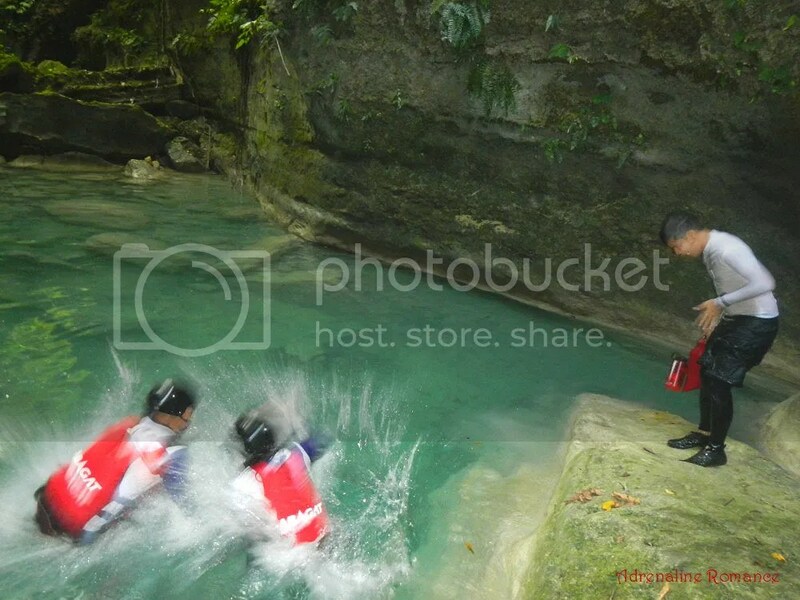 For safety, don’t make high dives no matter how tempting the water is without asking your guide’s permission. 9. It is strongly recommended that you know how to swim, even simple dog paddle or freestyle. If you don’t know how to swim, it is imperative that you wear a PFD. 10. For safety, do not stray away from the group. Keep them and yourself in visual range. 11. Take time and effort to check your footing and your handholds. Many of the natural features that you’re going to use are slippery and unstable. A wrong move can lead to injuries. 12. Use the webbing/rope that the guide provides. It’s there for your own safety and ease of traversing. 13. Do not disturb, handle, capture, or kill wildlife. 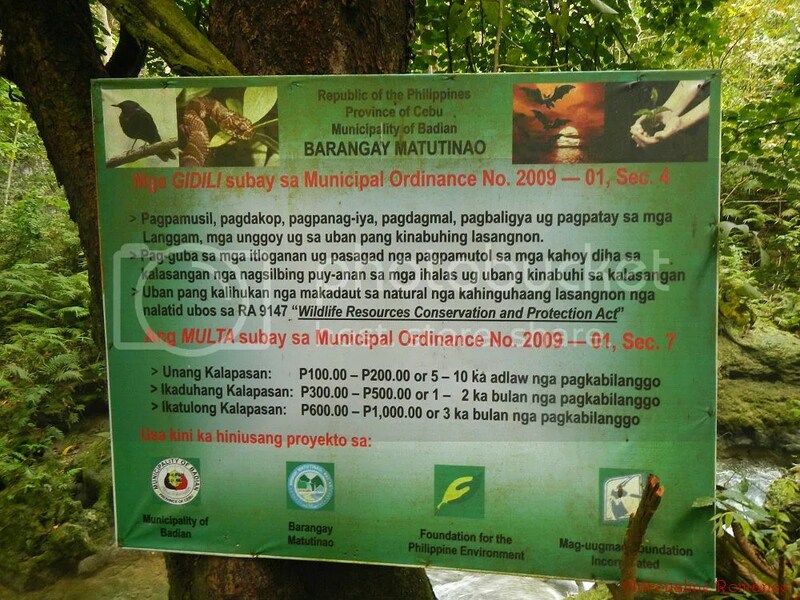 Doing so violates both Municipal Ordinance 2009-01 and Republic Act 9147 (Wildlife Protection and Protection Act. Remember to practice the Leave No Trace principles. Do not throw your garbage anywhere to protect and preserve the pristine beauty of the canyon. Your guide will provide the technical requirements such as ropes, webbing, and carabiners. 15. Obviously, you need to waterproof everything. But since you’ll be jumping, swimming, and getting splashed around by strong curtains of water, you need much more than just the usual Ziplock sandwich bag or plastic bag. We recommend putting your valuables, batteries, and money in a Ziplock bag then put that bag inside a watertight box (or something equivalent). 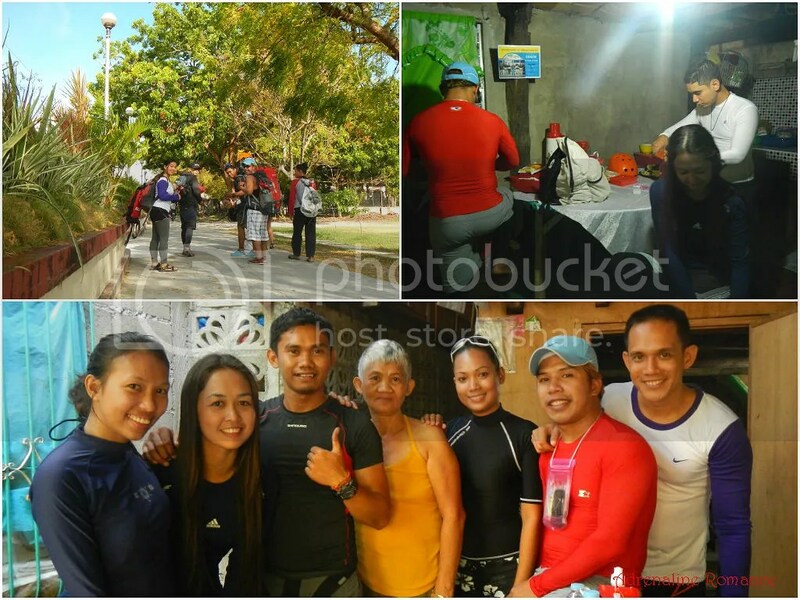 You can purchase watertight boxes and cases in outdoor shops like ROX Ayala, Habagat, or Cris Sports. 1. 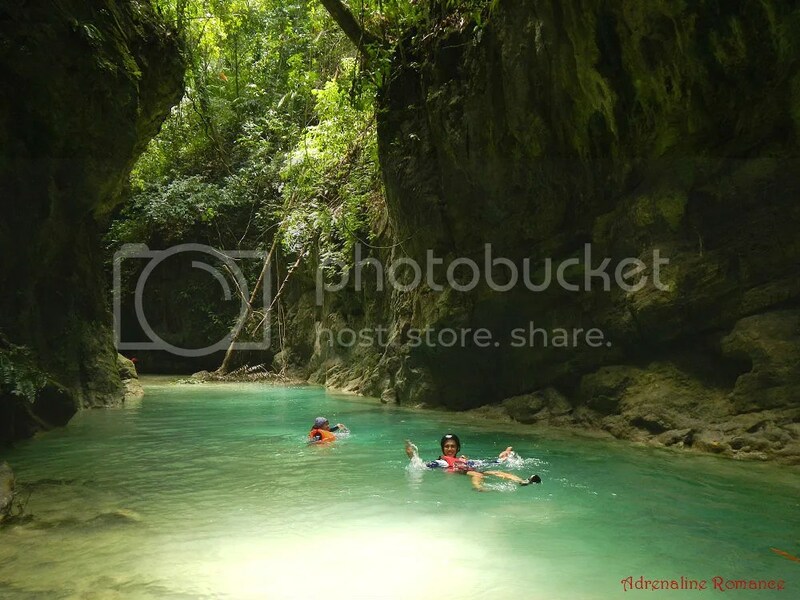 Oslob is located on the east side of Cebu Island while Badian is located west. In other words, they are opposite each other. Thus, you need rent a habal-habal (motorcycle for hire) goes around Santander (tip of Southern Cebu) or one that crosses the island. Most probably, that would take an hour or more. 2. We are not sure about the habal-habal fare for that trip as we haven’t tried it. Just prepare extra money—perhaps around 500 or more. 3. Regarding your canyoning adventure, please note that there was a government order to cease canyoning activities until August 31, 2016. Please get in touch with your planned provider or the Alegria/Badian tourism office for updates and details. Typically, we don’t compare activities and destinations. 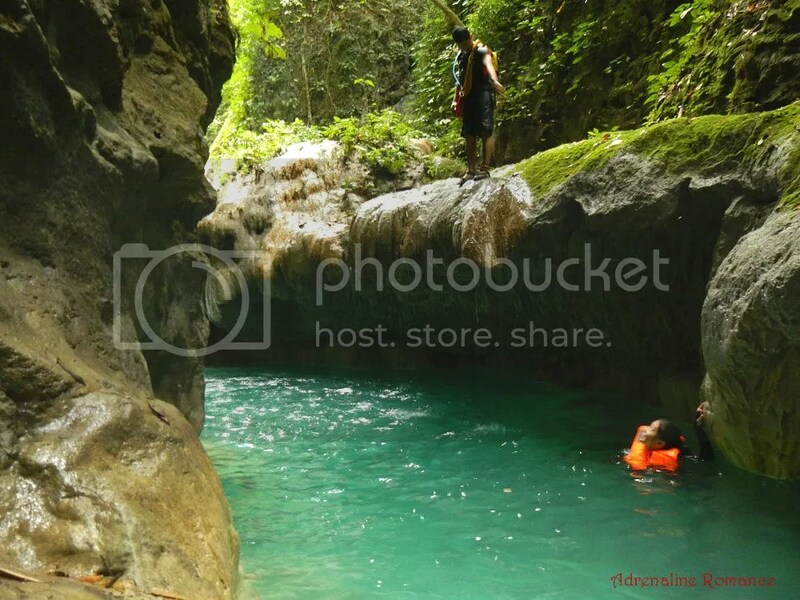 But after experiencing canyoning in Biliran, we can’t help but compare. 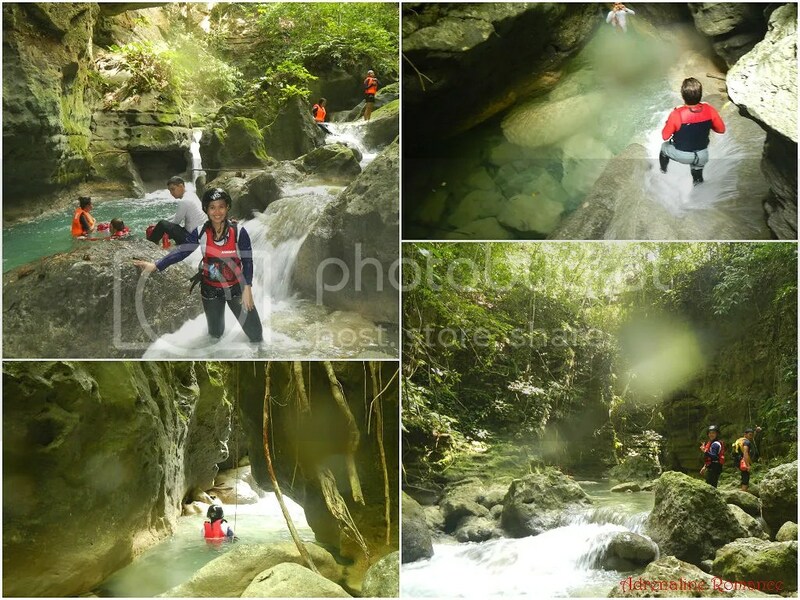 Joni’s adventures are way better than the commercialized canyoning activity in Alegria-Badian, whether upstream or downstream. 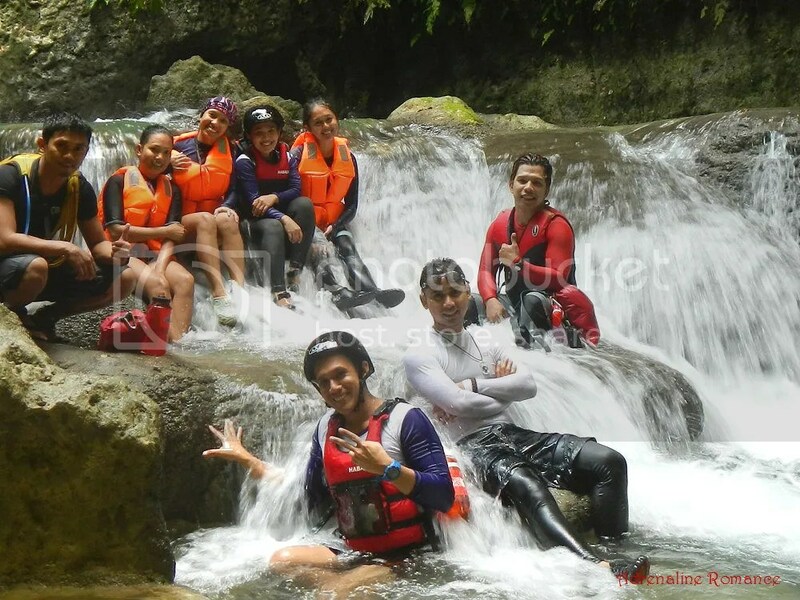 In Biliran and Catbalogan, the rivers are totally pristine, there are no throngs of tourists, the guide is a true canyoneer, and the adventure is more adrenaline packed. We’re not sure what you mean. 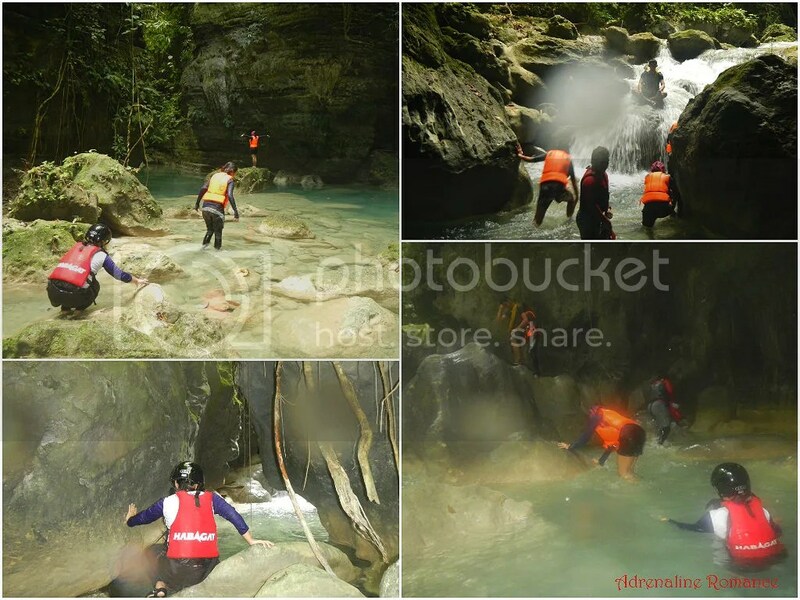 Canyoning is a mix of hiking, jumping, and swimming. Are you referring to the entire canyon? Or are you referring to the hike from the highway to the starting point? Obviously, this sound so exciting to do. My wife is keen to attempt, however, she doesn’t know swimming. Is it advisable to take this leap of faith & jump off the cliff for this adrenaline rush? Thank you so much! Don’t worry if she does not know how to swim. She will be wearing a PFD/life jacket. 🙂 Yes, taking that leap of faith will be so much fun! If Sweetie can’t swim how did she handle the whole experience? Hi Mitty! She wore a PFD. She couldn’t dive or submerge; she just floated. Recently though, she took swimming lessons and now knows how to swim.